Weather – It changed every day. Sunny…cloudy…windy…humid…broiling hot. Take your pick or combine any two or three of the above. Water – Mostly pretty blue, but find the cleanest warmest blue water currents and your chances of finding fish increases. Stay away from cloudy water. Fishing – Tuna are big and mean. And we lose 3 out of every four fish. They are eating light line and taking a 40-80 pound fish on 25 or 30 pound test is a battle that can last 1-2 hours. It’s a slugfest. 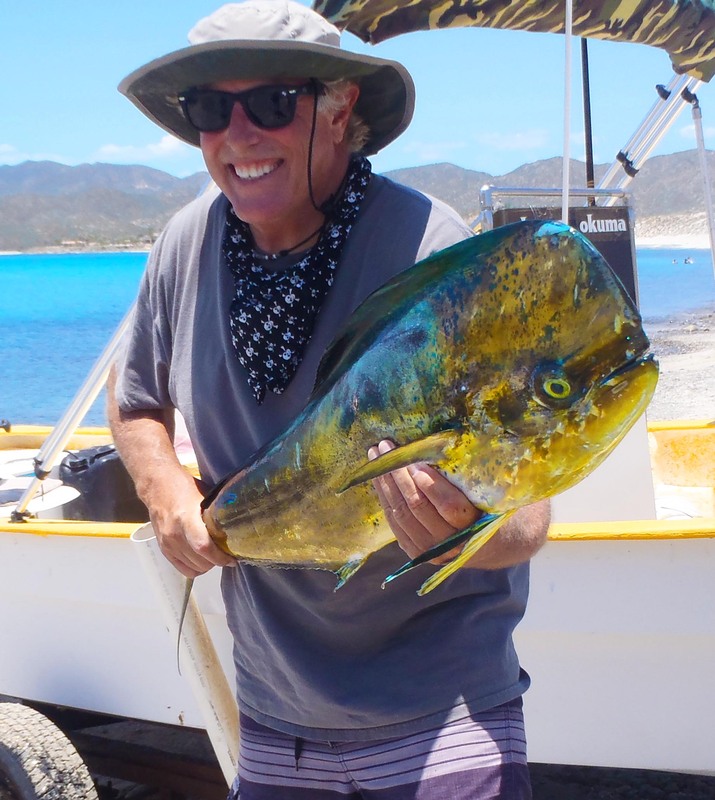 The dorado are all over, but not always willing to bite. They’ll jump the baits, but won’t always eat. You have to be patient and let them swallow the baits. Then, there are days when they’ll eat anything you throw in the water. Catching – The bigger the fish, the more we lose. And we’re losing alot of fish. It’s not bad fishing. It’s bad catching. These fish are seriously testing us. But that’s what makes it fun. You have to find them first. Then, you gotta get them to bite. Then, hold on!!! These two know how to pull on fish! Spike and Jamie Ivins hooked 5 of these tough fish and 3 pulled but got these two fatties to to the deck. Spike was one of the most awesome deckhands on the San Diego long range boat, Red Rooster. Great to see them! 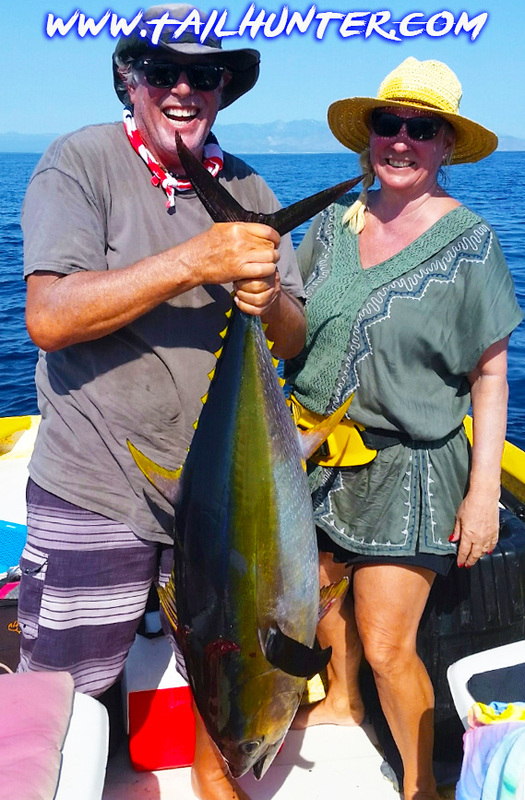 Captain Armando help with photos duties on two big yellowfin tuna caught by Bill and Pam Eggleston. The fish were caught near Cerralvo Island and fought each fish over an hour! 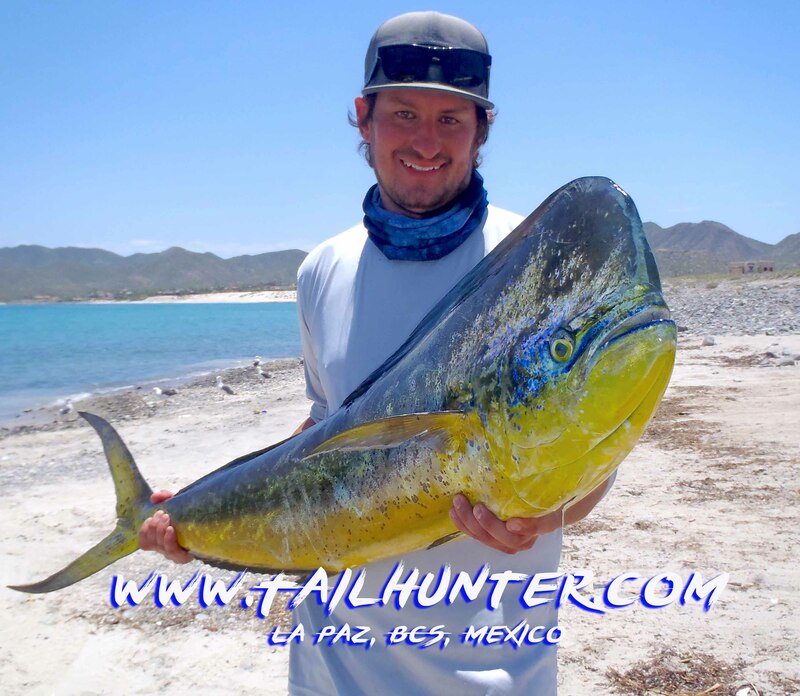 Beautiful bull dorado caught on the other side of La Paz Bay by Brian Reid of Waco, TX. The big bull chowed on a live sardine. Craig and Cathy Corda, our good amigos, had quite a week with us. Oh this particular day, Cathy hooked one tuna and fought it for a long time and the hook straightened. She hooked another one and a shark ate it. Then, she hooked another and Craig hooked this one and they had two on at one time…and a huge whaleshark swam in between them! You just never know what’s going to happen on the water. Captain Jorge with our good amigas, Verda Boyd from the S.F. 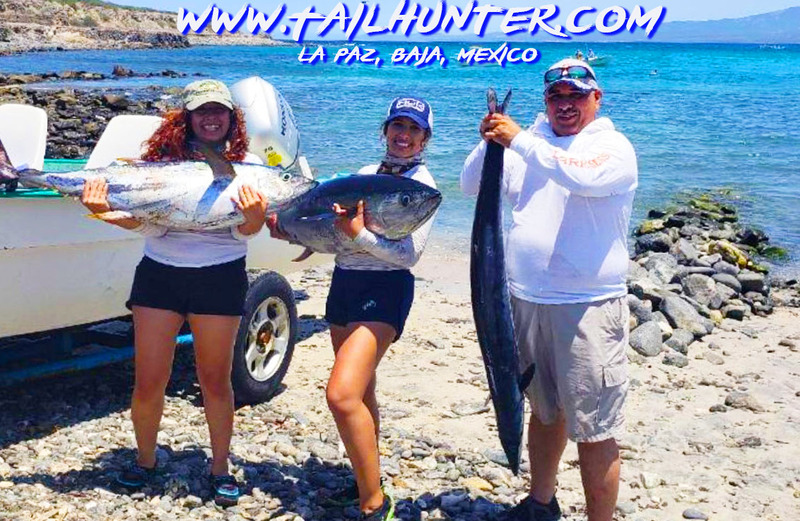 Bay Area and Pam Bolles from Loreto’s famous Baja Big Fish Co. and famous flyfisher. 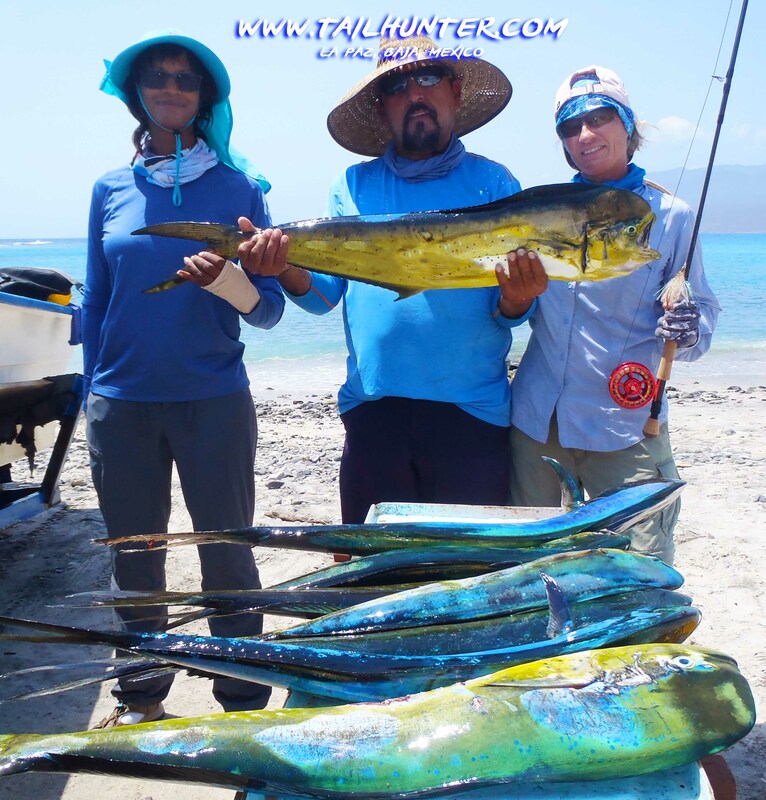 The ladies nailed a limit of dorado that day. 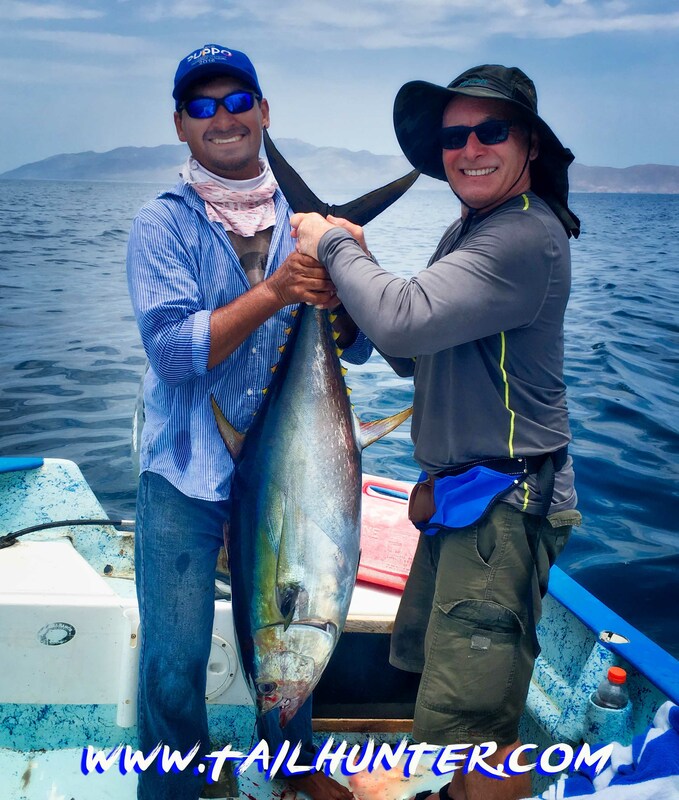 Nathan Anaya has his hands full with this stock yellowfin tuna. These fish are thick, heavy and powerful. 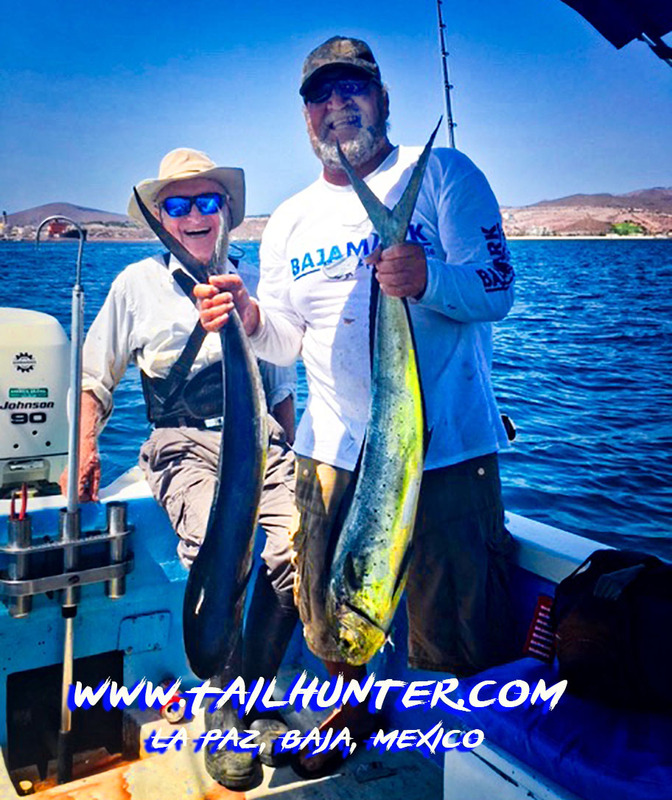 Barbara and Les Campbell started their trip out with an ice chest full of dorado fillets fishing with Captain Adolfo. Daughter, Jessie Reid, just has the knack for taking down big fish…even when she’s 6 months pregnant! No big deal! 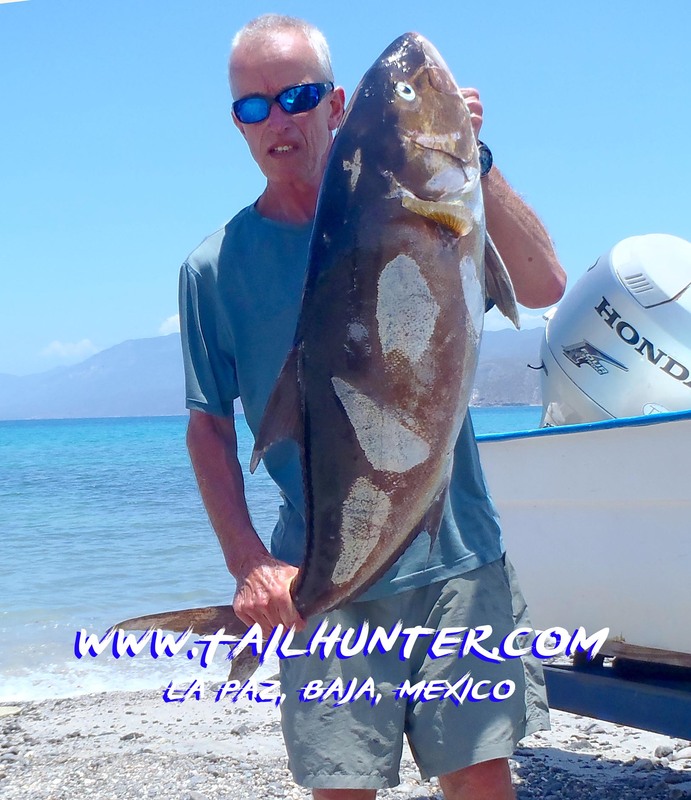 She was fishing with captain Victor with our Tailhunter Las Arenas fleet when she stuck this big bull. Jessie lives in Waco, Texas. It has been many years since Kenny Duong fished with us and, in fact, caught an IGFA world record 16 pound triggerfish the last time he was with us (I stopped him from cutting it up and eating it!). But he got this good-looking yellowfin tuna off Cerralvo Island late in the week when the tuna came crashing. This is such a great photo despite one of those cloudy days we had mid-week. 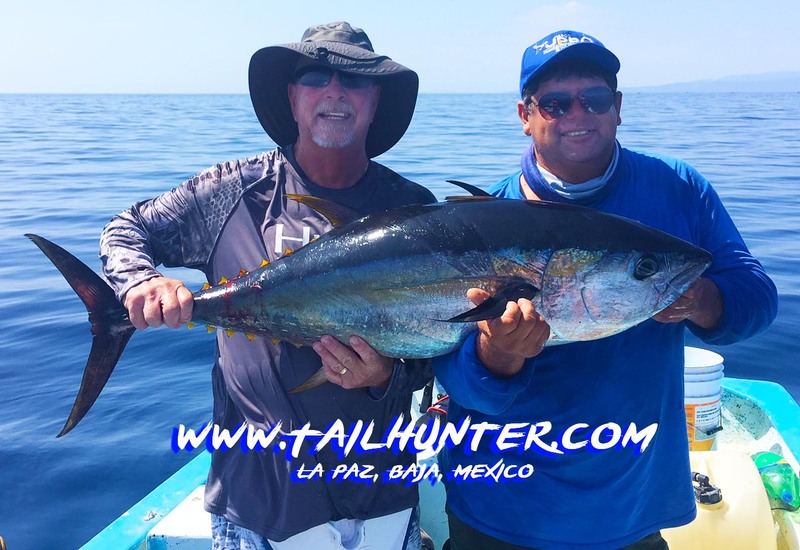 Captain Adolfo and Les Campbell with another yellowfin tuna for the camera and the ice chest. I need to frame this photo! Jamie Ivins pulls hard on a big roosterfish with Captain Pancho looking on. The roosterfish photo is below. Swimming off strong! 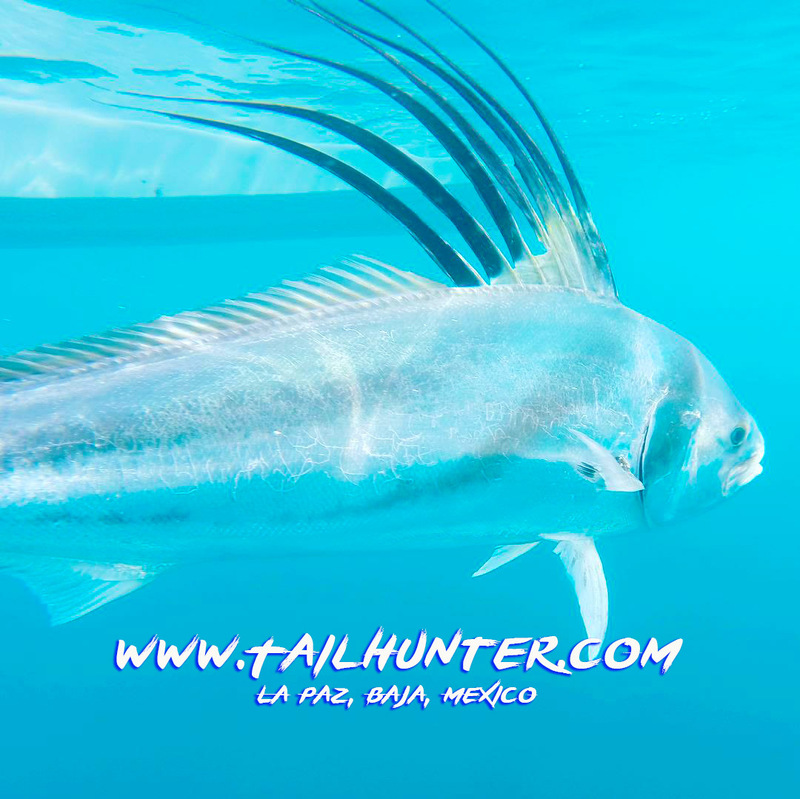 Spike Ivins jumped in the water to photo the release of Jamie Ivin’s roosterfish. Great shot! 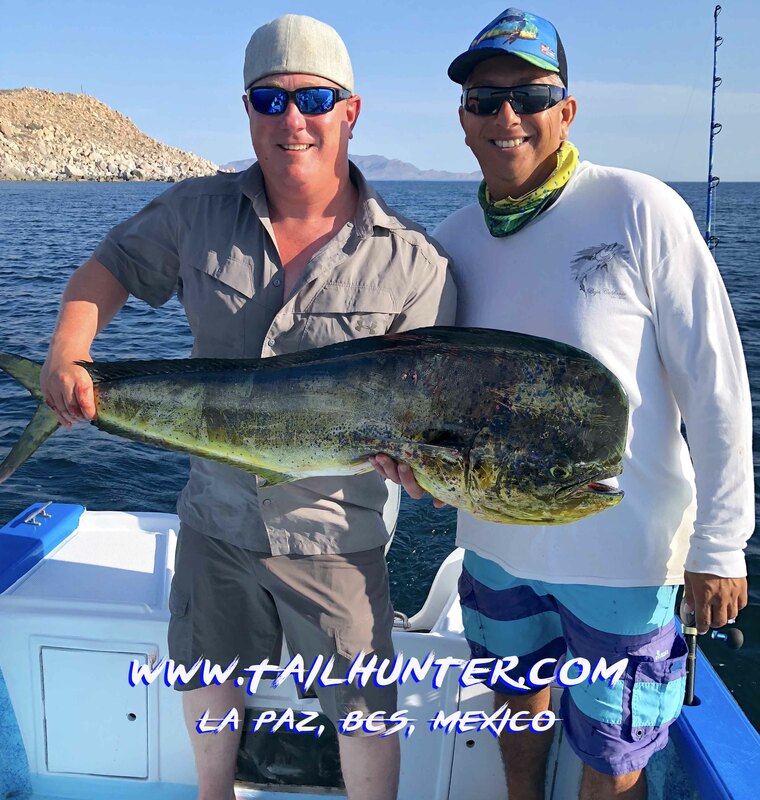 Big smile from first-time visitor, Tom Grindle who was fishing north of La Paz City with Captain Rogelio and got a load of nice dorado including this colorful bull. 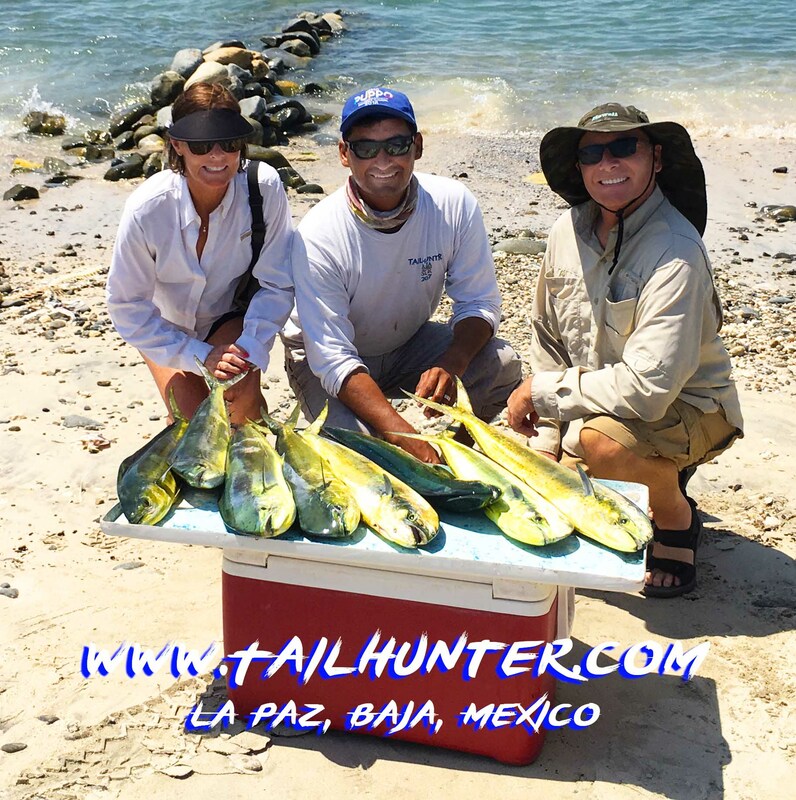 Luis Arandia and Raul Rodriguez pulled a number of dorado out near San Juan de la Costa. Luis had an unusual method of getting the fish to bite. See the video at the end of the fishing report! She’s a tiny little gal who can pull on fish. 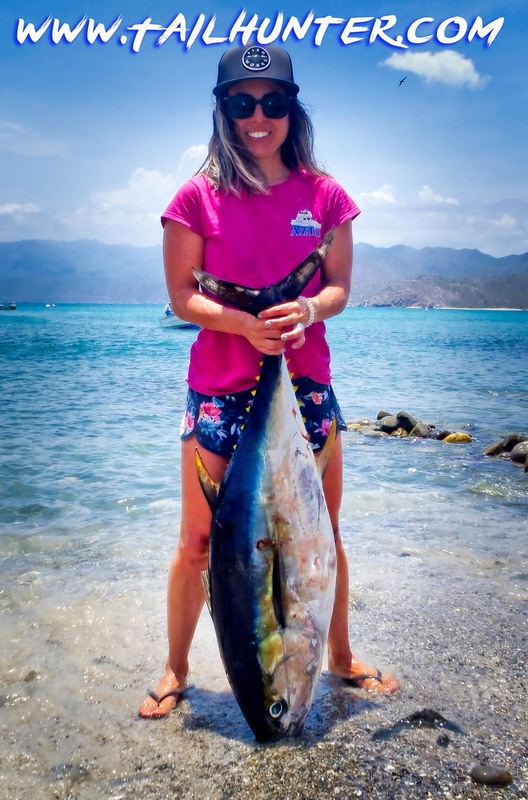 Jamie Ivins poses with one of her yellowfin tuna on the beach at Bahia de los Muertos. 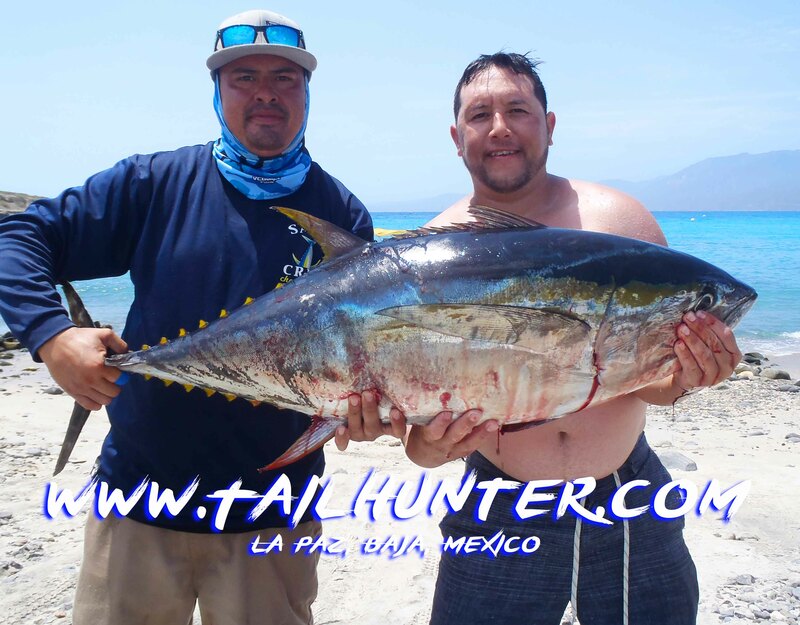 Captain Pancho with one of the big tuna this week on the beach at Muertos. Yes, even I get to go out sometimes! Double dorado with my son-in-law Brian Reid from Waco, Texas who had quite a week of fishing. It can be a long hot day when your rod is bent on a single powerful fish for a long long time! Bill Eggleston holds on as a big tuna rips more line! See the fish below. Nothing pulls like a tuna! Bill Eggleston got this one up after more than an hour on the rod. With Captain Armando. 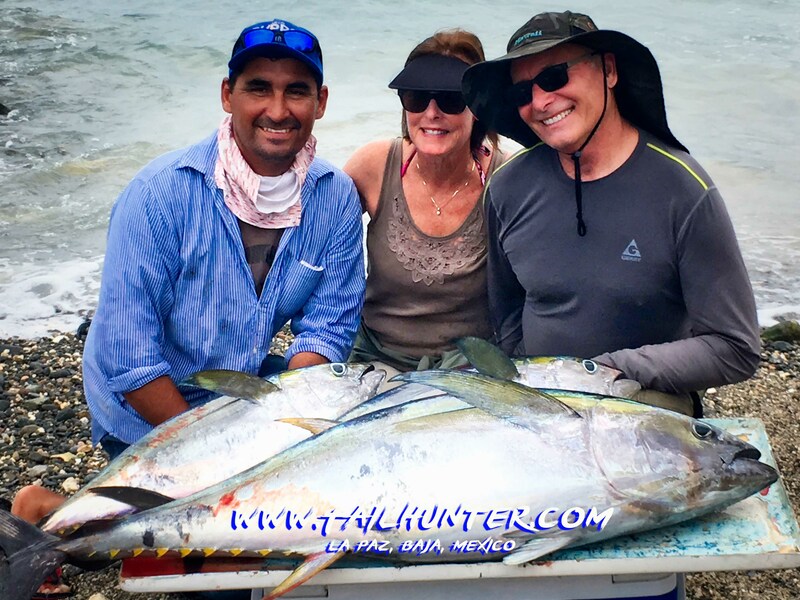 Triple biters of yellowfin tuna for Captain Adolfo with Barbara and Les Campbell. One of our funnest long-tme amigos, Bob “Pops” Henke shares a laugh with Captain Alfredo posing with two of their Las Arenas dorado. 1..2..3…LIFT for the camera! Noel Santoyo holds up one of his 4 fish they took that day. Yellowfin ranged from 40-80 pounds. 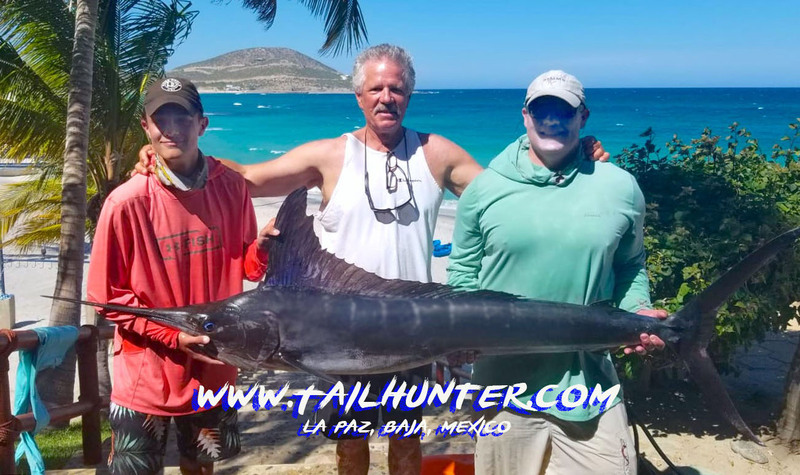 Frank Cruz gets a hand from Captain Adolfo and Captain Archangel with his striped marlin on the beach at Muertos. They were unable to release the fish but donated the meat to everyone. On his way to college at Oregon State next year in the marine biology program, Ian Grindle has himself a good-looking bull! 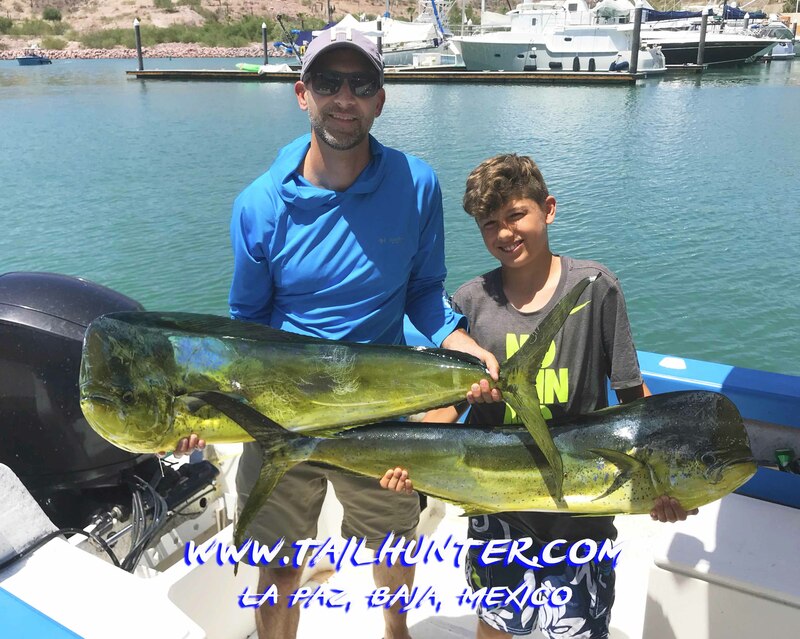 He and dad got limits of dorado on Captain Rogelio’s boat. Luis Arandia wasn’t getting bit so he decided to think outside the box and do a special “fish dance.” Turn up the sound and check this short video out. Right after this, two nice dorado bit the lines! 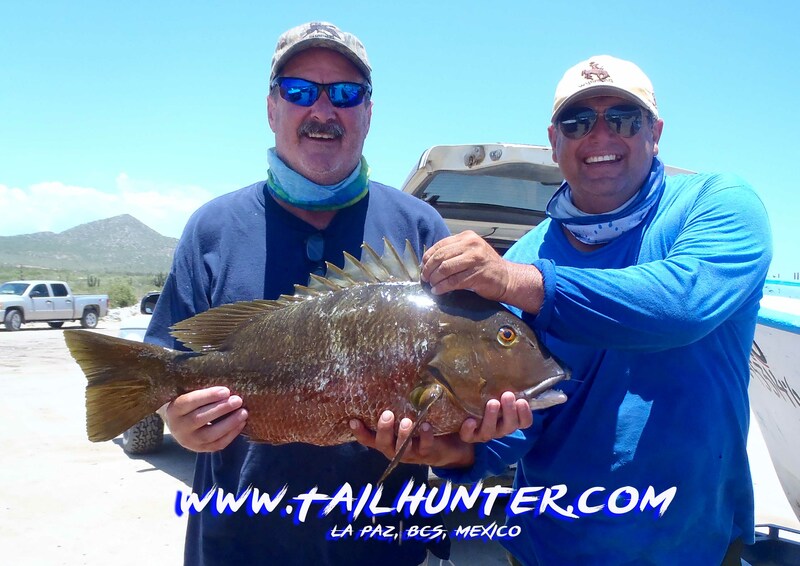 It was a week of unpredictable full moon fishing this past week here in La Paz waters. Everyone got fish, but trying to figure out where and what and how were elusive. It was impossible to figure out the bite this week. One day the dorado would go crazy. The next day in the same spot, the dorado would be finicky. Another day, the tuna would bite like mad dogs and the next day, they acted like whipped puppies. Roosterfish were the same. So were the inshore fish like pargo and cabrilla. But everyone caught fish! It was the same with the weather. One day hot and sunny with blue waters like a picture postcard. The next day, it would be cloudy and choppy. The next day, cloudy but still and oppressively humid followed by sunny and windy days. And this affected the fishing too. The best thing was just let the captain take you to whatever is biting. The folks most impacted by the erratic fishing were folks who just fished one day…like freelance folks or folks who walked into our office right off the street and wanted to fish one day. That day COULD be a funky day or the funky spot of fish or the funky weather. If you were fishing with us, like most of our anglers, for 2, 3, 4 or more days, you probably got into several really good days of fishing and a nice load of fish to take home. Several variables to note, however. Yes, the tuna came back at Cerralvo Island off Las Arenas/ Muertos Bay. If you looked at the “number” of fish we caught, you would think fishing was bad. But, if you knew the whole story, fishing was actually pretty good. We’re losing 3 out of every four tuna that we hook. These fish are beasts to most people. They are tough, savage 40-80 pound fish. Everyone wants to catch one. Few folks have ever had the experience of catching one! It’s one thing to want to catch one and another to be bent over in the sun for an hour or two on a straining rod and tortured line on a fish that yanks off 100 yard bursts in a single run. It’s heartbreaking then to lose a fish like that…and we lost many of them! And to hook one then get another one and lose it after a long battle can just crush you. Or to get it so close where you can see the fish then have it pull lose…and there’s nothing you can do. One other thing is that these fish are biting LIGHT LINE! We’re using 30-pound fluorocarbon leader so you’re already at a disadvantage on these fish as well. It would be nice to hang fish on heavier line…even 50 pound test would make a huge difference, but then you won’t get bit! As for the dorado, we caught a lot of them this week. The thing about them is that they were all around, but not always ready to eat. They normally take a bait voraciously, but this week, it seemed like they would run with a bait and drop it. Or they would literally attack baits and toss them around and play with them. 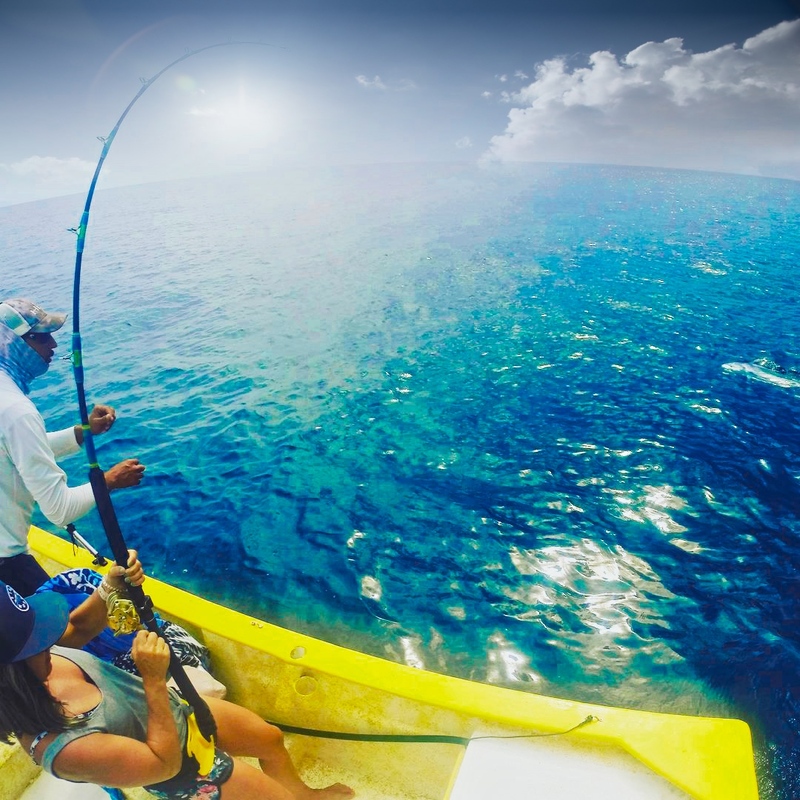 To hook dorado, you really had to restrain yourself from setting the hook. You had to let them run…and run…and run…until you were sure they had swallowed the bait before pulling the trigger with a solid hookset. Lastly…it looks like we might get some thundershowers late this week. It might force some cancelation of fishing days. Make sure you purchased travel insurance! Chelsea Roos and Don Vegter brought down an entire set of outfits, gear and uniforms for a youth soccer team! 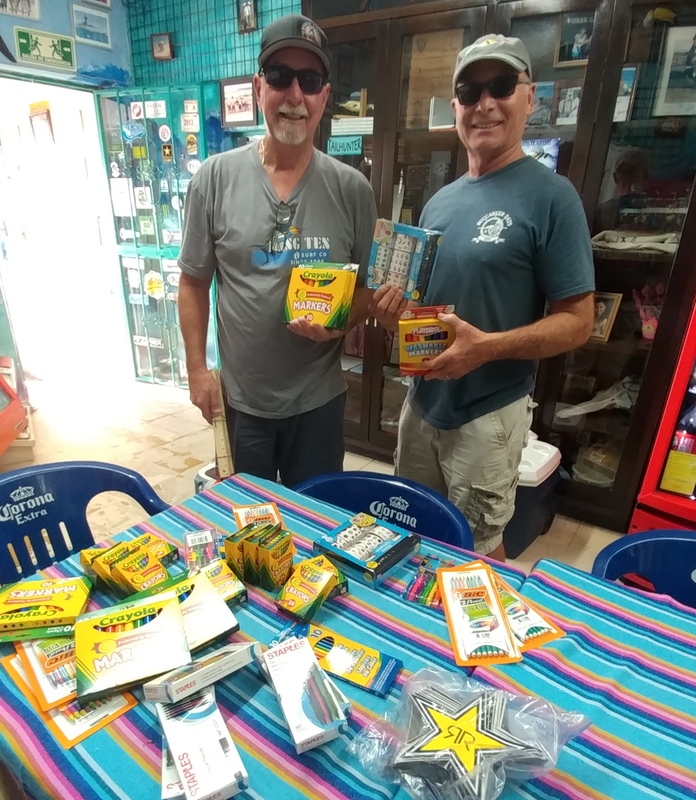 Bill Eggleston and Les Campbell hauled down a load of great school supplies for the kids at the orphanage. 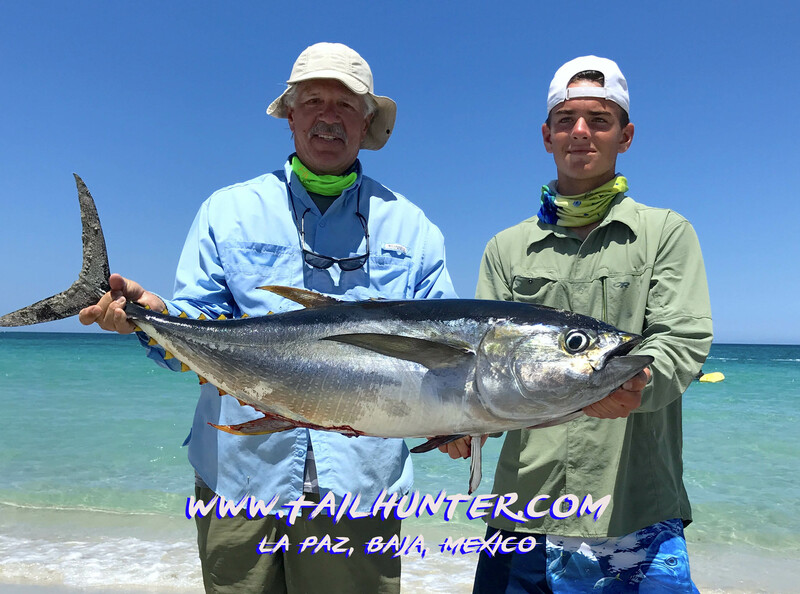 Our Tailhunter Outreach program keeps rolling thanks to folks like our Tailhunter amigos and tribe members who find space to bring down great things for our donations. Thanks to all of you! Weather – Sunny and muggy most days. High 80’s to low 90’s. Other days it was just muggy and gray and heavy! Humidity on those days was way high. One day we even had tropical thunderstorms with lighting and wind that came up out’ve nowhere. When it was sunny, the fishing was better. When it wasn’t sunny, fishing wasn’t so good, especially earlier in the week. Water – Warm and mostly blue in the low 80’s on the surface. But it’s still incumbent on the fishermen to find the warmer and bluer water where it tends to be clearer and more likely to hold fish. Fishing – It was tougher earlier in the week when we had clouds and even some rain. Waters were mostly fishable but the fish just didn’t want to bite even tho’ we could see them boiling and jumping. Got better later in the week as skies cleared. Catching – Wish we could have boated some of those big tuna we lost. But, they are big fish for a reason. 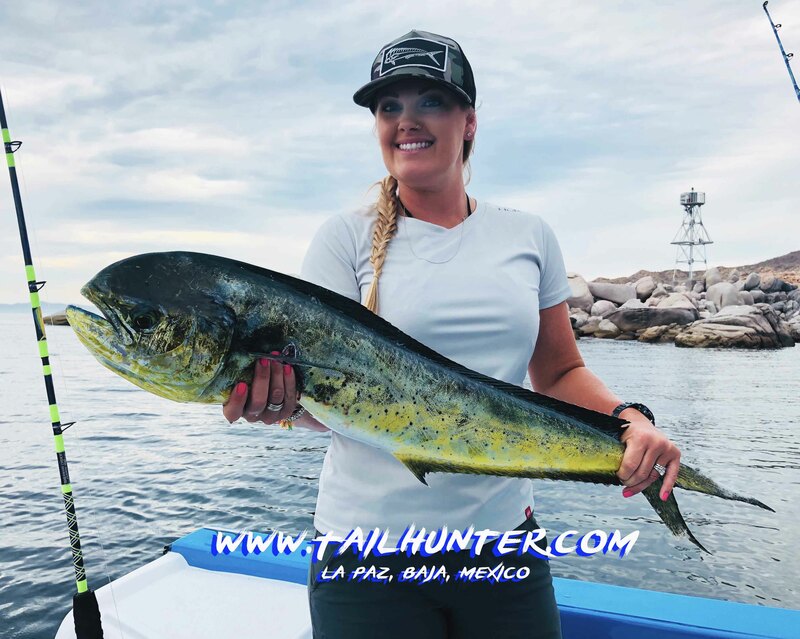 Elementary school-teacher from the San Diego Area, Traci Valade caught her first tuna and it was a dandy 50 pounder she handled all by herself off Cerralvo Island fishing with Tailhunter Sportfishing. Husband John Valade helps, however, with the photo opportunity. Big smile from Grant Jensen from Woodland WA and a pretty bull dorado not far from Punta Arenas. Wow! Thank you, Gary Wagner for this great shot of about a 60-pound rooster being released and headed back down from the surface! 2. 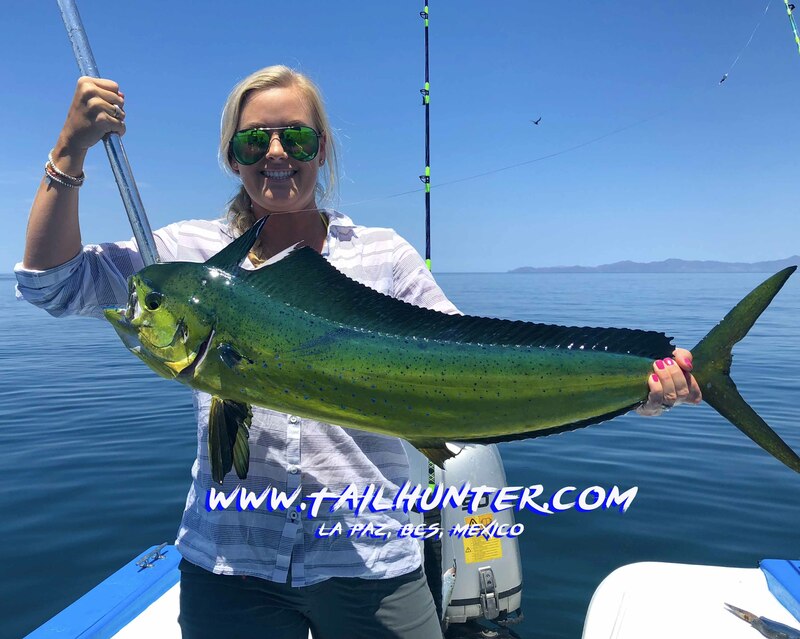 Michele Conklin from Washington fishes every year with Tailhunter Sportfishing in La Paz and knows how to pose with her fish. 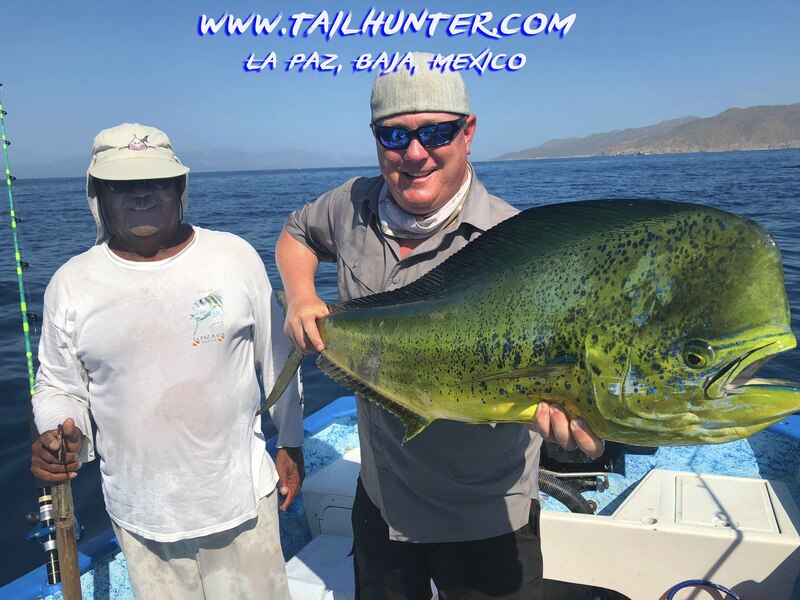 She caught several larger dorado plus had a big tuna on the line as well while fishing from Bahia Muertos with live baits. 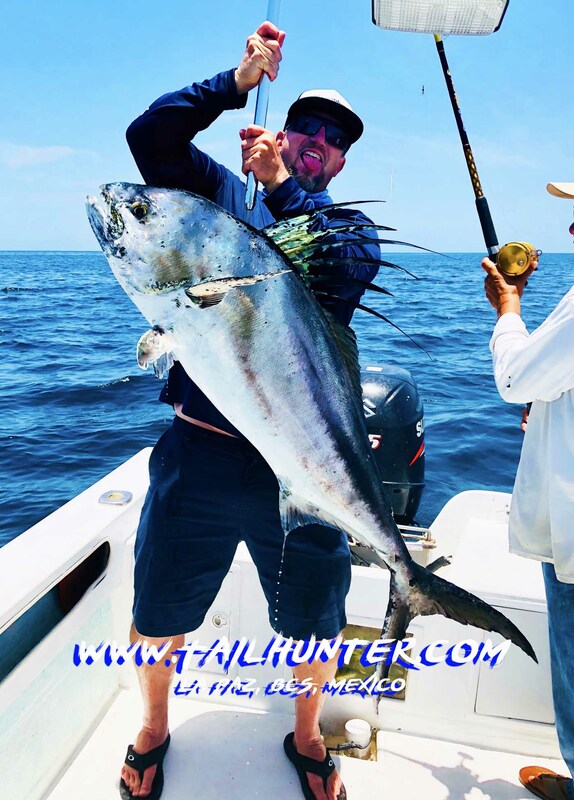 All the way from Corpus Christi, Texas, Rafael Rios fishes every year with Tailhunter Sportfishing and was trying to get one big tuna. 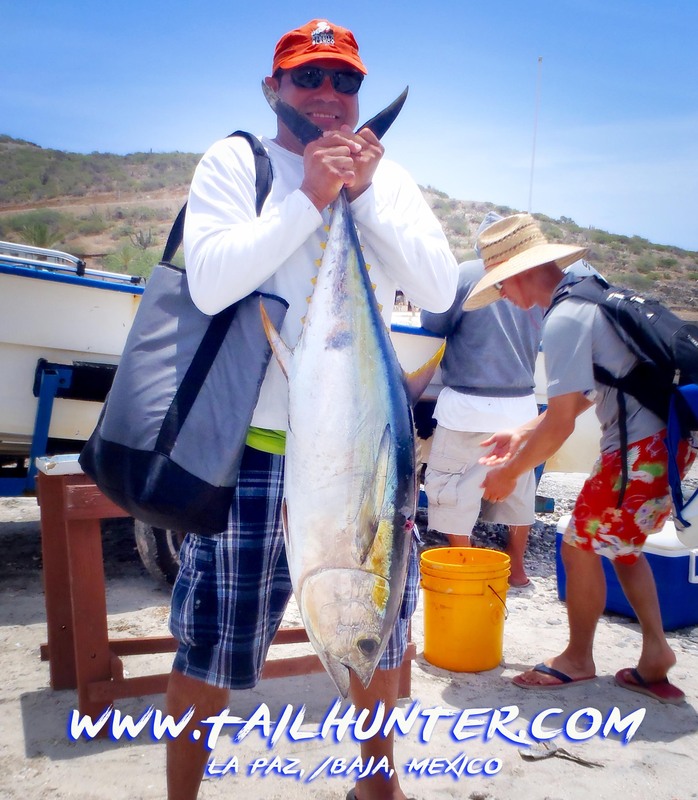 After 2 days of struggling, his last day, he finally tied into this big yellowfin while fishing with Captain Gerardo. Estimated size was 60 + pounds. What an incredible photo and yes, these are the true colors of what I like to call a “Tiger Blue Dorado.” No such thing but that’s what I personally call it when we get one of these gorgeous fish! 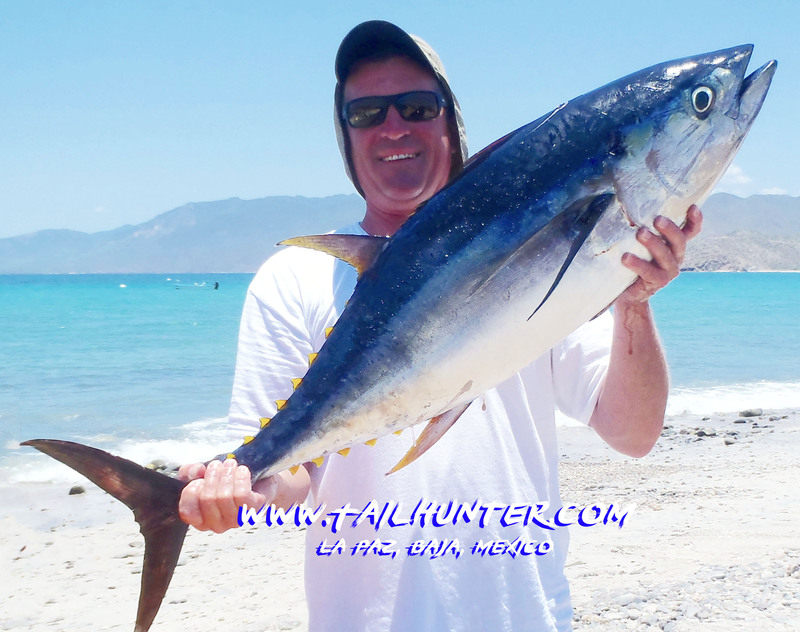 Dave Conklin, our Washington amigo, caught this one just outside of Muertos Bay fishing with Captain Jorge. 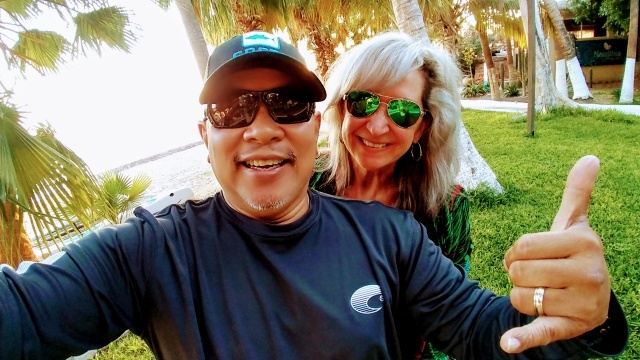 ou’ve heard of a “photo bomb.” How about a “photo bum?” Craig Corda has a funny way of getting into the photo with Cathy Corda by facing his “bum” at the camera! Great shot! Nicely done, Craig! Good day fishing! It’s almost bigger than her! Ann Zelibor and her big roosterfish while staying in Muertos Bay at Gary Wagner’s Rancho Costa. The fish was released. 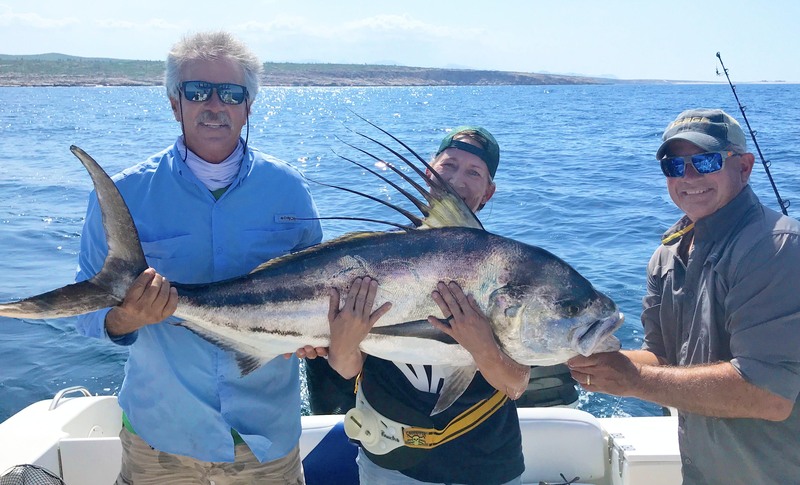 San Diego in the house with Mike and dad, Bob Stasiak and a nice pair of bulls caught north of La Paz. Our amiga for so many years and so many visit here, Cathy Corda holds onto a bull dorado she caught just outside of Bahia de los Muertos. You remember that first one! 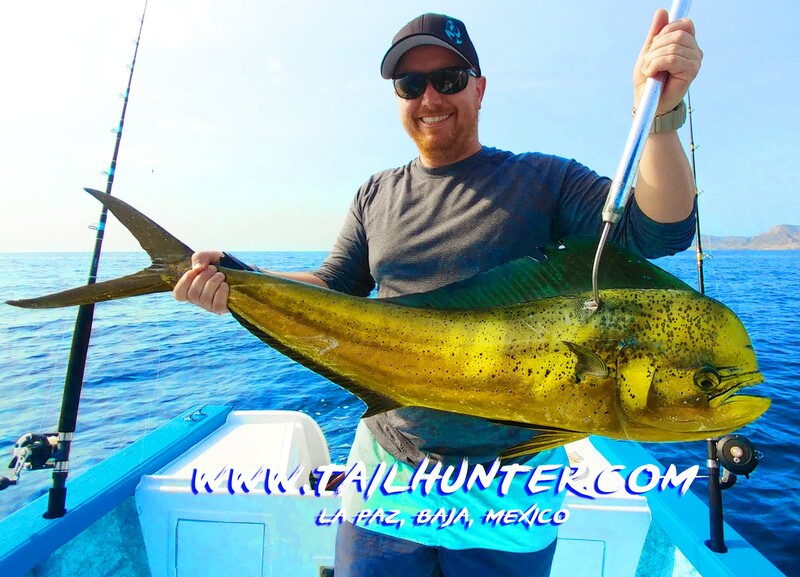 Colin Huston wanted so badly to catch a dorado! Here is at the Costa Baja Marina with his prize. 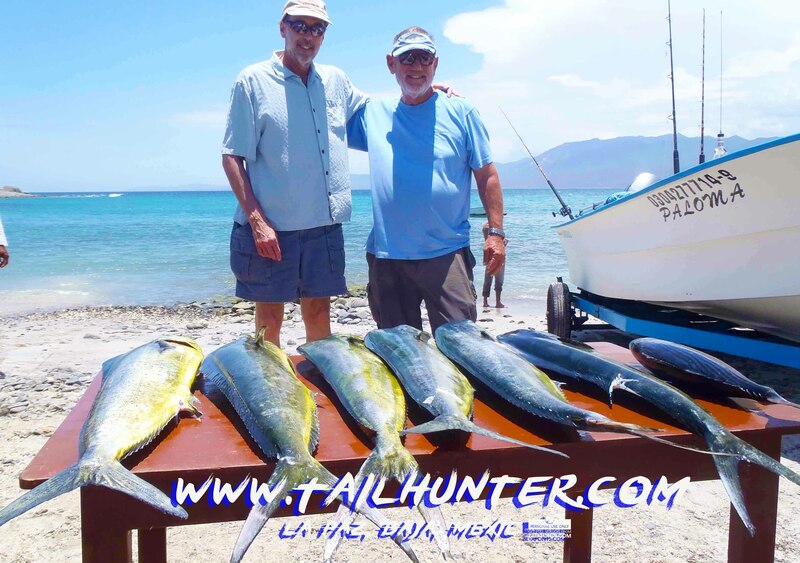 Colin caught about a dozen different species of fish over 2 days for his first salt-water experience. Check out all the colors! This dorado looks like it’s part of a Monet painting! Rafael Rios and Captain Jorge. The week was marked by erratic fishing that pretty much co-incided with the up-and-down weather patterns we got. It really was all about the weather. Even us locals were commenting that the weather was strange. Several days, it was cloudy and oppressively humid. In many areas and heavy stillness sat on everything where there wasn’t even a breeze. The waters were so flat that you could not tell where the grey ocean ended and the grey sky began. It seemed like there wasn’t even any current. And the fish just didn’t want to bite. It was really picky. 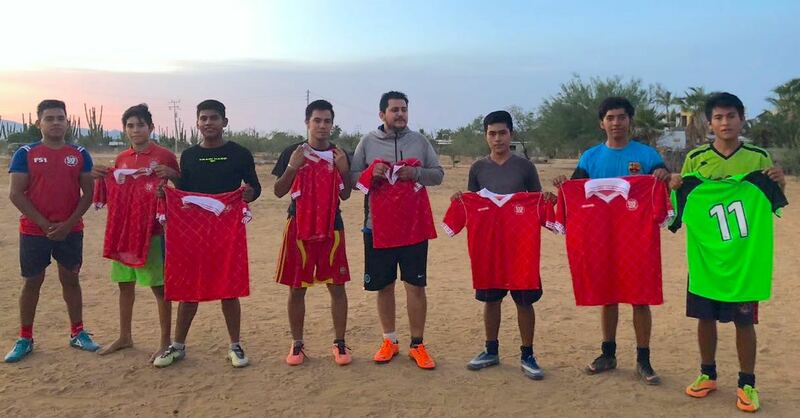 Strangely in other areas, the grey skies brought thunder, lightning and even heavy localized rain that drove fishermen to seek cover back on shore especially at Las Arenas and toward the East Cape…while back in La Paz, it was calm and gray. But, again, the fishing bite was stingy even when we could fish. And the rough conditions affected fishing by turning over the water; bringing cooler waters up from the deep and scattering the all-important schools of bait. So, fishing, especially early in the week was a hit-or-miss proposition. Fish were caught, but the bite was definitely off. 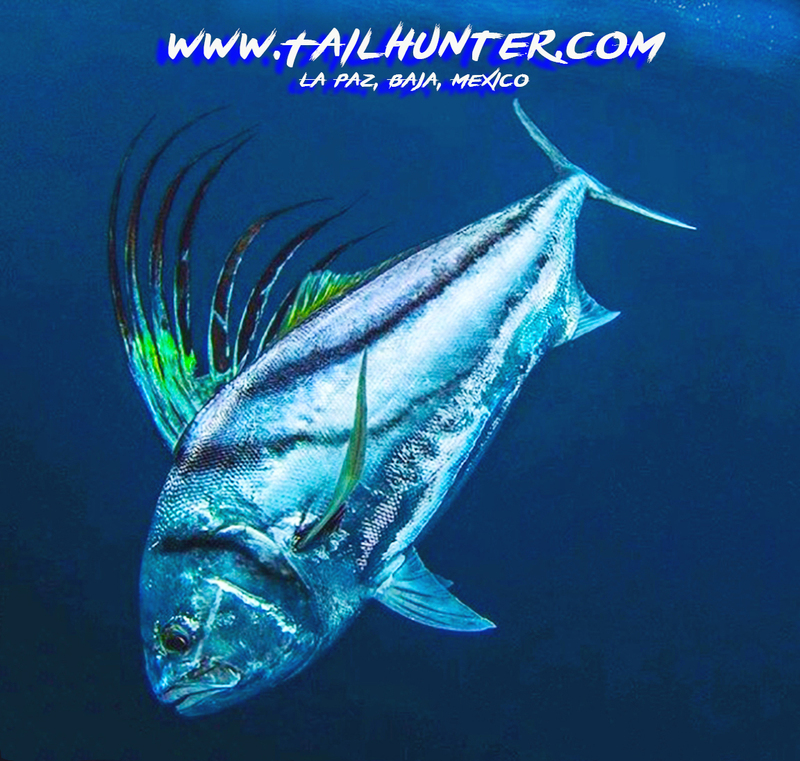 Crazily, many of our anglers saw tuna…they saw dorado…they saw marlin…but the fish would refuse to bite even though the fish were chasing and breaking and seemingly feeding. They didn’t want anything attached to a hook. They didn’t want anything dragged behind a boat either. Mid-week, the weather cleared and bright sunshine returned. And the fishing picked up noticeably. 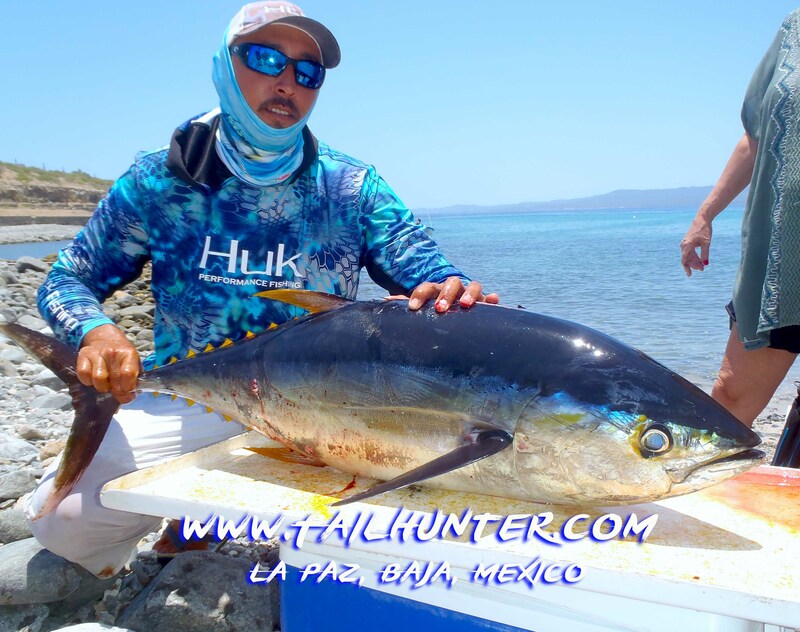 Tuna at Cerralvo Island between 40 and 60 pounds finally decided to eat hooked baits although they were somewhat line shy and preferred very light leaders. That didn’t bode too well for long battles, but at least there were hook-ups! Dorado decided to tear it up as well as wahoo and roosterfish. It was a complete turn-around. Then, late in the week the clouds returned but this time with winds! And the bite tapered off again. Everyone still got fish and there was action to be found, but we really had to work hard to find fish and get them to bite. Jilly and I wanted to take a special shout-out to our friends in the San Diego Anglers Fishing Club. They heard that during the recent fires in San Diego that our home had burned down. There were many who sustained losses, but we were thankfully not among them. We don’t have a home in San Diego nor do we live there, but an area where Jill used to live was devastated. The San Diego Anglers reached out and held a collection at their monthly meeting and collected $700 for us! To our fish brothers and sisters, we are touched beyond words! We know you do alot of work for charity and the community so hopefully, the funds can be used towards that or possibly to the many folks who actually suffered losses from the fires. Weather – Hot and humid! Temps in upper 90’s during the day. Low 80’s at night. Bring shorts and don’t forget your hat and sunglasses and sunscreen. Warmer weather means better fishing! Before we whined about too much wind. Now some days we wish we had a breeze! Water – In the 80’s, but last week water temps dropped from the mid-80’s to low 80’s and it seemed to affect the fish with the abrupt change. Cooler waters got a bit dirtier. 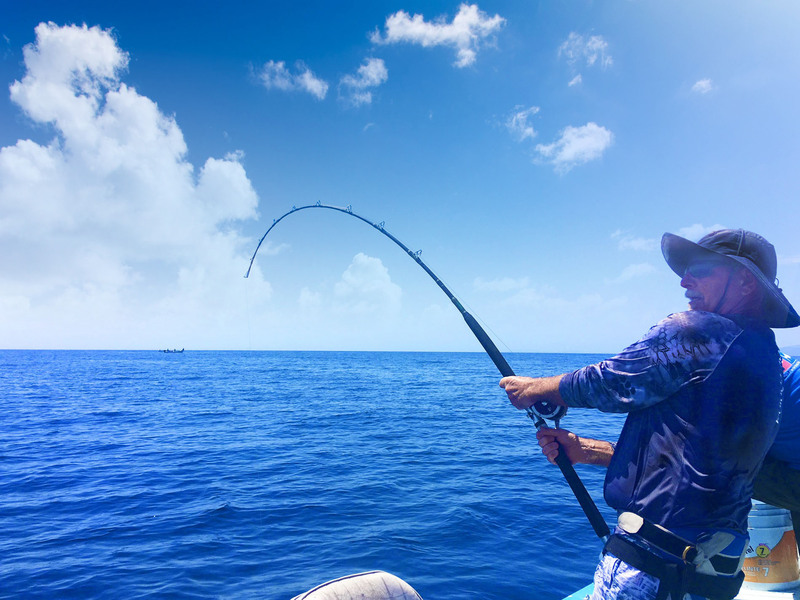 Find the blue warmer water for the best bite and to locate fish. Got better as the waters cleared up later in the week. 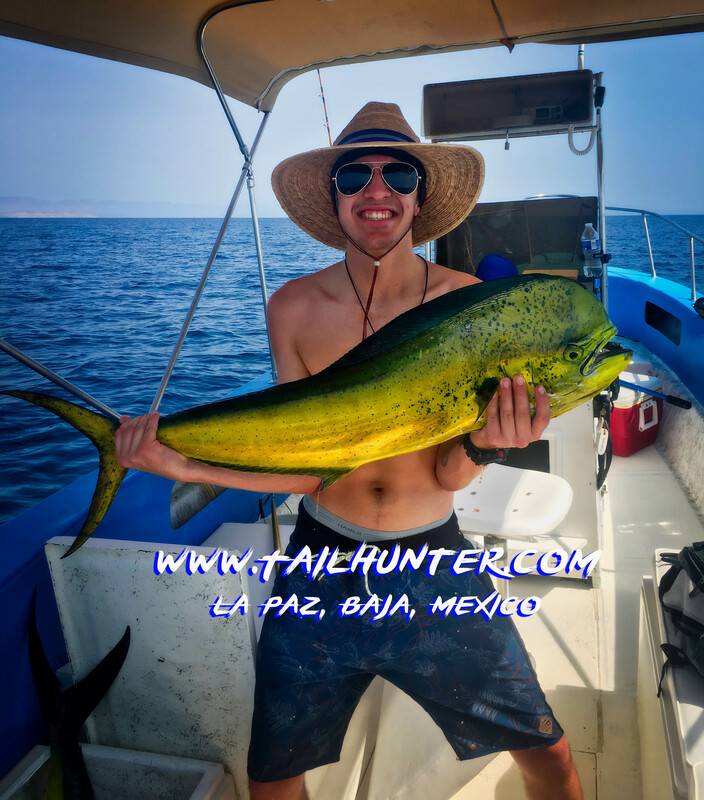 Fishing – Dorado are 70% of the bite right now. More fish schooling up which is great and very typical of warm summer fishing. Seeing more marlin these days. Still tuna, roosterfish and wahoo around. But more folks targeting the mahi. 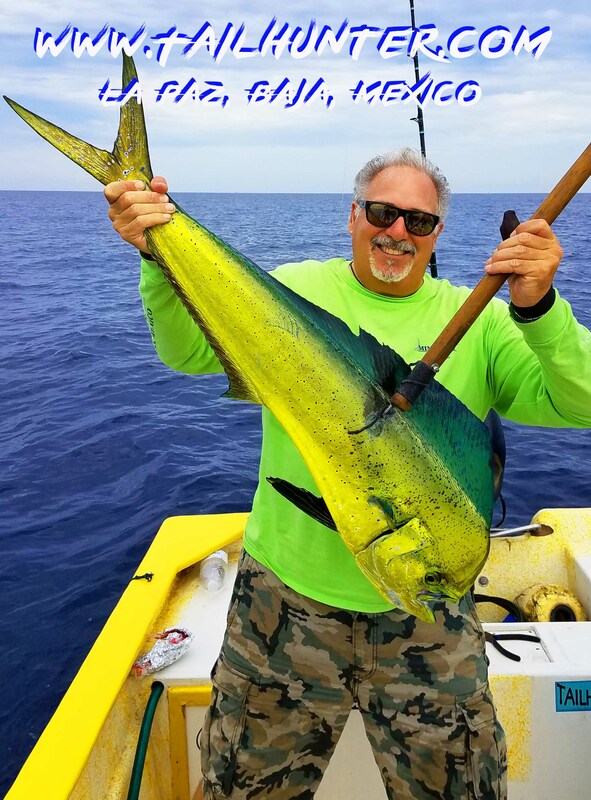 Catching – Alot easier to catch dorado than other species! 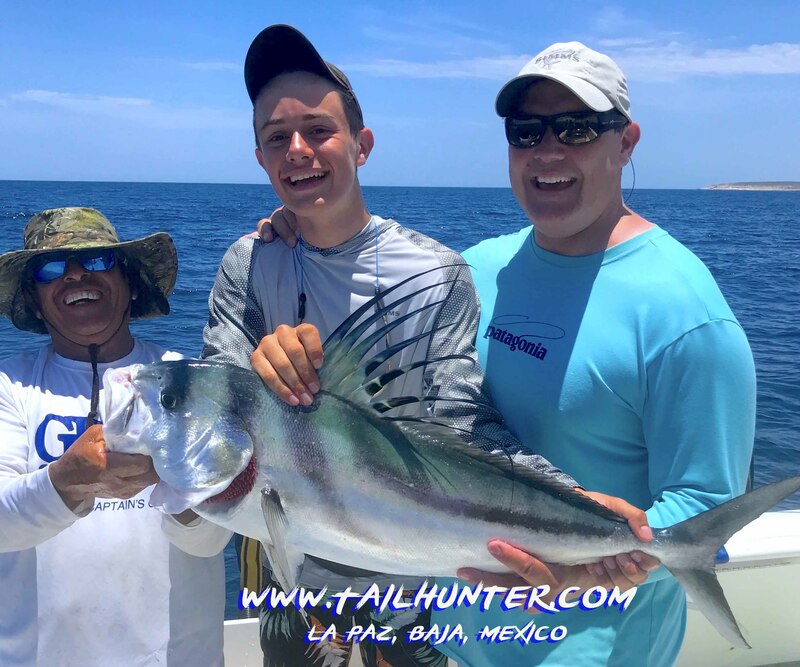 Chance Wallis all the way from Kentucky was dragging live bait close to the rocks near Las Arenas when he got this big roosterfish to roll up on it. The fish was released. Nice start to a fishing vacation for John Vondrak and his buddy, Kirk. A table full of dorado fillets! 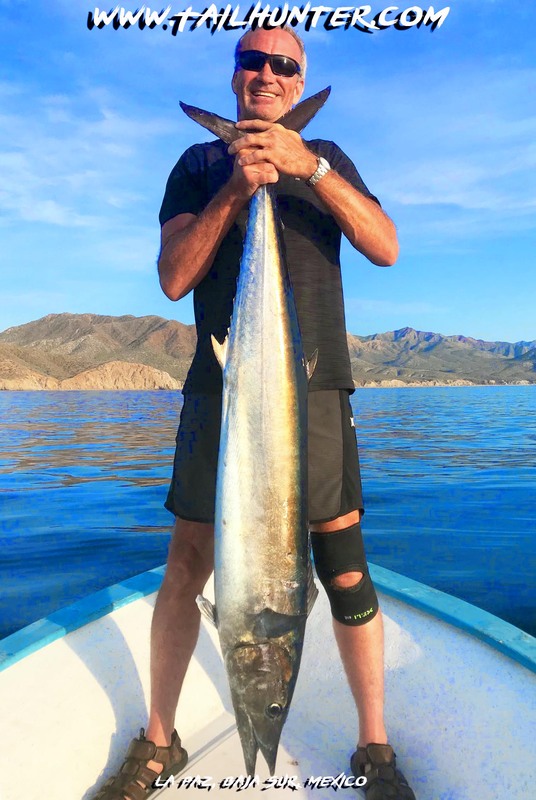 Greg Garrison from San Diego always does well with the fish when he’s down fishing La Paz and took this speedy wahoo trolling a Rapala just outside of Bahia de los Muertos. Hard to find a prettier photo than this! 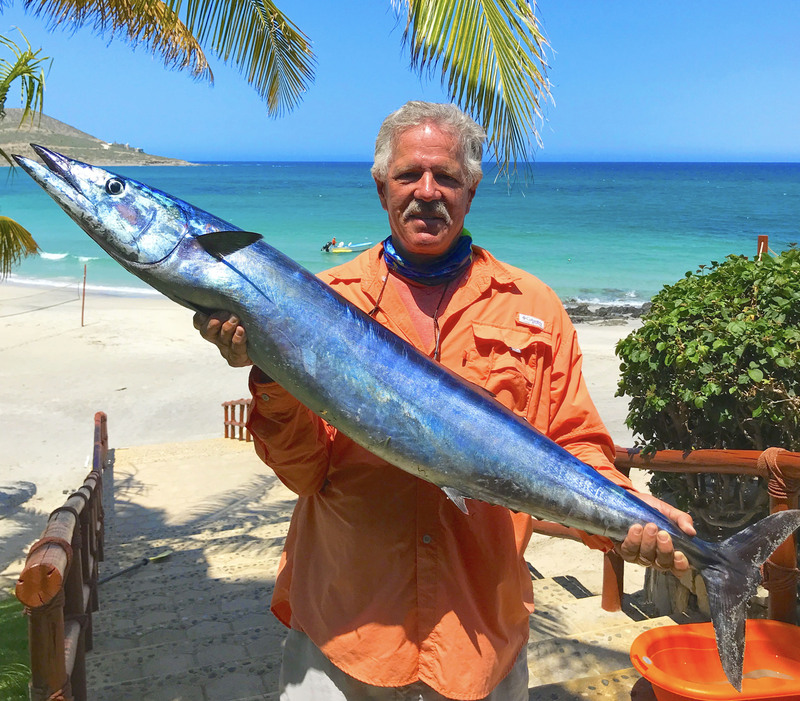 Nice wahoo for Gary Wagner, owner of the Rancho Costa in Muertos Bay and the famous Giggling Marlin bar in Cabo. Thanks for all the photos, Gary! She didn’t have to go out far for this nice tuna. 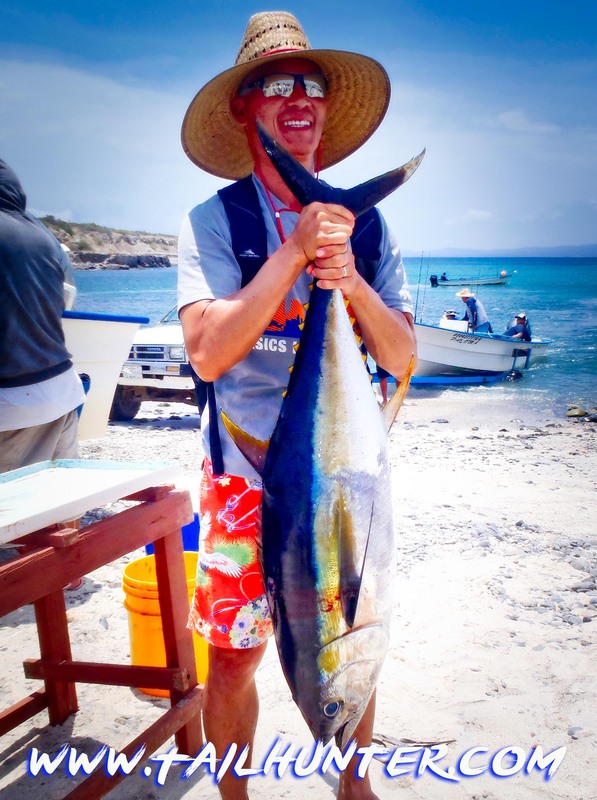 Sydney Wagner from Colorado Spring CO staying at Rancho Costa in Muertos Bay hung this nice tuna just around the corner relatively close to shore. 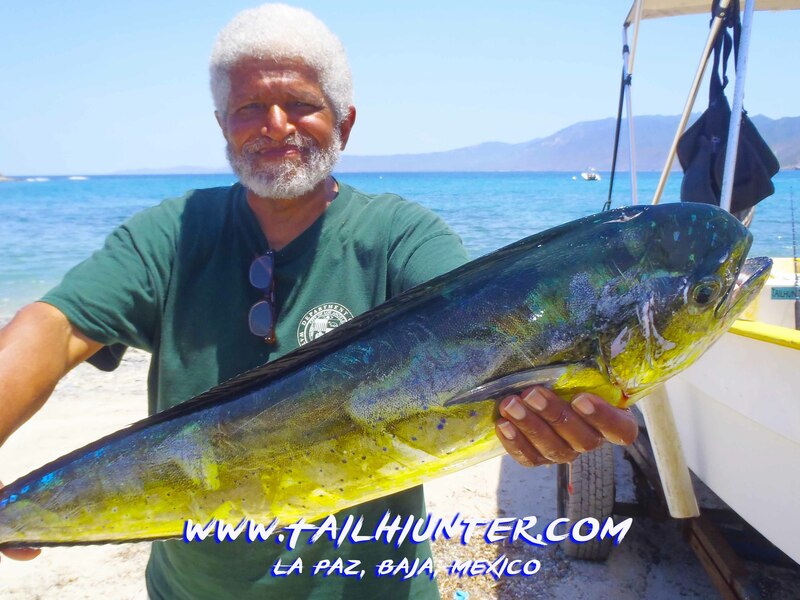 Captain Joel poses with Bennett Clegg’s big bull caught just off Espirito Santo Island north of La Paz…dorado-landia! Matt Wallis has his hands full with this fat yellowfin tuna off Cerralvo Island. 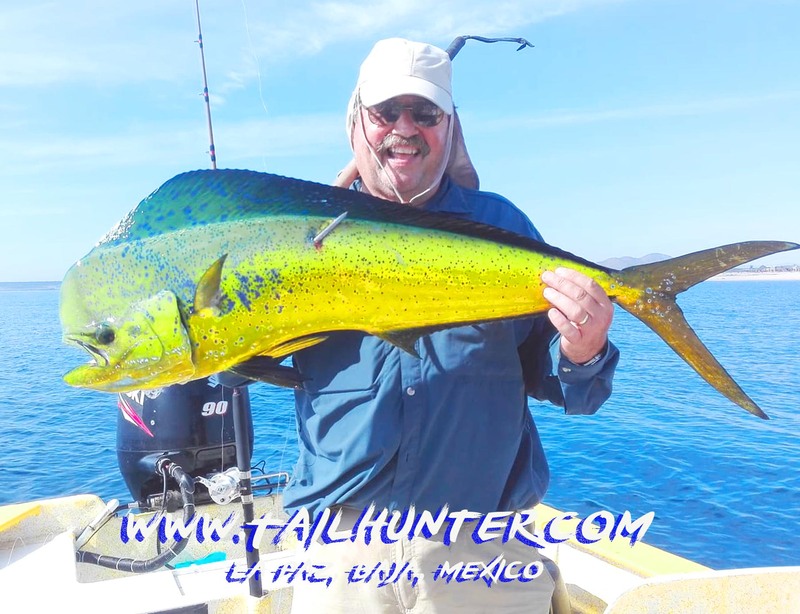 On the flyrod, Tom Zelibor from Colorado got this nice dorado to his his pattern. Matt and Jackson Duystschaever with their striped marlin with Gary Wagner at Rancho Costa. Muertos Bay in the background. The fish could not be released. Jackson Duytschaever is all smiles with his roosterfish. Jackson is from Colorado and released the fish. Another happy Colorado fisheman, Paul Milewski has a big tuna to hold up for his photo. It was a decent week of fishing down here. Like seemingly everywhere else on the west coast, weather was hot, dry and humid although water temps took a bit of a dive for some reason dropping from 85 to 81 degrees and getting a little cloudier and greener. Still…everyone caught fish. 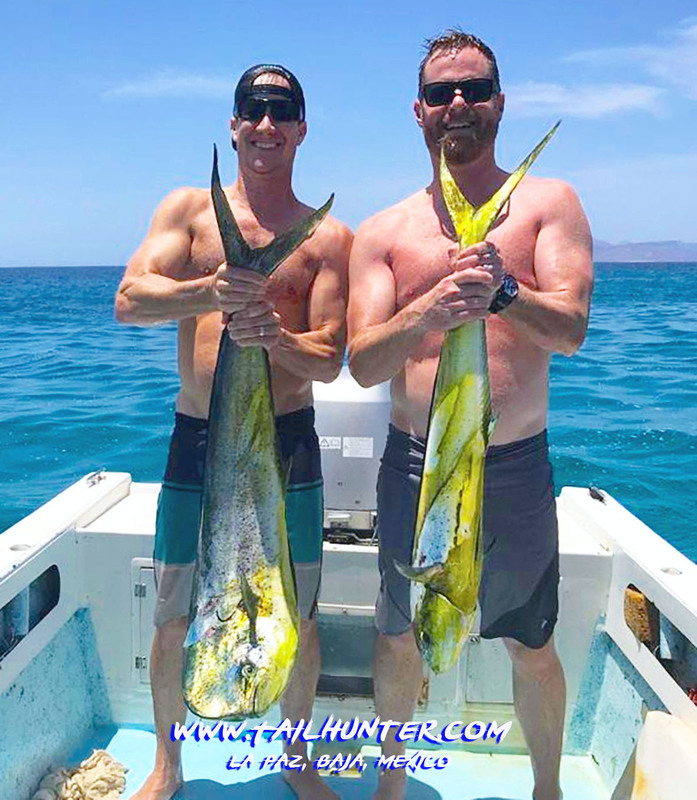 Not as many tuna or wahoo as the previous week, but the dorado bite seemed to fill the gaps with more dorado being caught each week. This is a typical summer pattern. Some boats did better than others and some days were better than others. However, for most of our anglers fishing multiple days, the could count on getting bit. The secret is finding the right spot. There’s a lot of fish, but the fish are not everywhere. Locating the right current line (warmer water); or bluer water was key. But also finding structure like floating and clumping sargasso weed on the surface could make the difference. 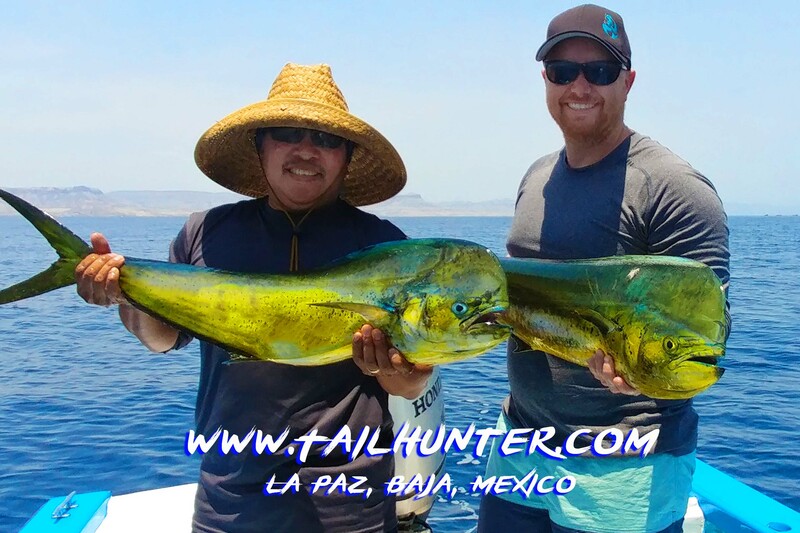 In addition to the dorado, there’s still some chunky tuna around. The smller fish are 40 pounders. Not many folks looking for roosterfish, but they’re along the shores and good sized between 40 and 70 pounds . 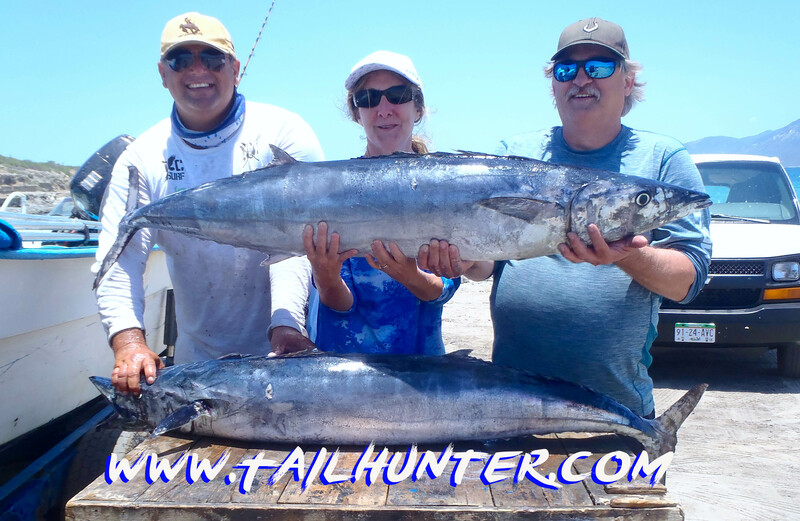 Wahoo are still hanging out as well, but we’re losing more than we’re catching and we also saw more hookups on striped marlin this week than any other week with most fish either busting off or getting released. Sorry about the audio quality. It really wasn’t THAT windy, but I forgot my wind-screen microphone and I had to do this all in one take because I was almost out’ve batteries on my camera! Hope you can still understand it! With apologies for being an idiot! Weather – Hot and humid for the most part. Day time in the mid-90’s and nights in the low 80’s. In short, perfect fishing weather. We did have a little bit of drizzle one morning for about an hour then the sun came blazing. Water – Getting warmer and bluer each week. Plus sargasso weed is building which co-incidentally has alot to do with the better dorado bite. 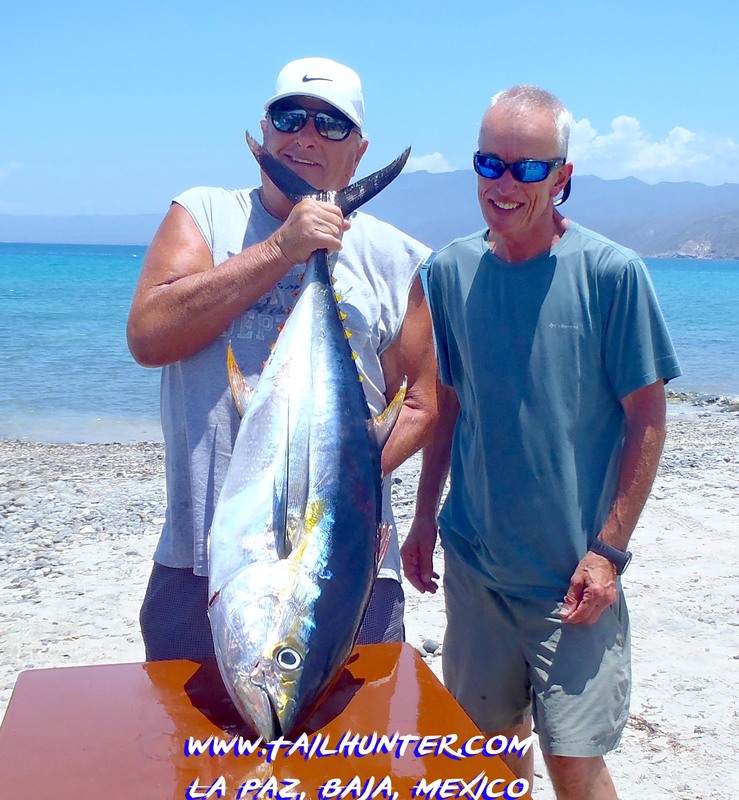 Fishing – Not so many big tuna this week. They were there and sometimes would chew and other times not. But dorado, wahoo and roosterfish helped fill the slack. Some days better than others. Some boats luckier than others. Catching – The bigger the fish, the more we lose! Lost some big marlin, big dorado, bit tuna and big dorado this week. Happy fella! 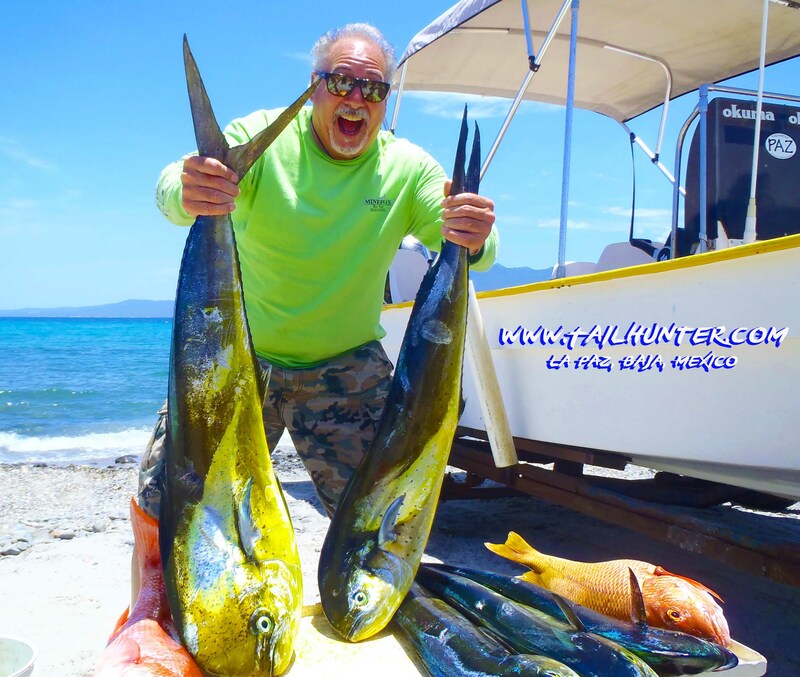 Darrell Manginelli from Ventura CA shows off a rack of nice dorado plus two nice snapper after a day fishing out’ve Bahia de los Muertos. First day is a good day! 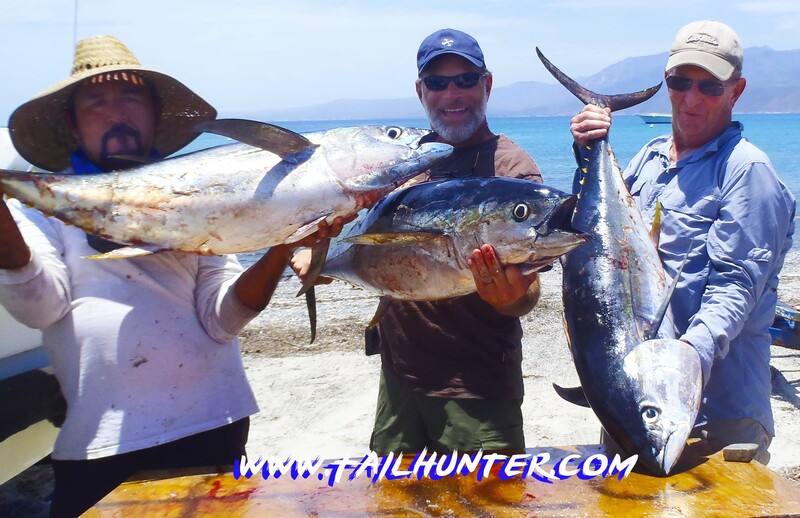 Captain Jorge with Mike and Marta Shaw showing off some quality tuna and dorado near Las Arenas. Whoa! Nice bull, Jason! Yes, you made the report, amigo! 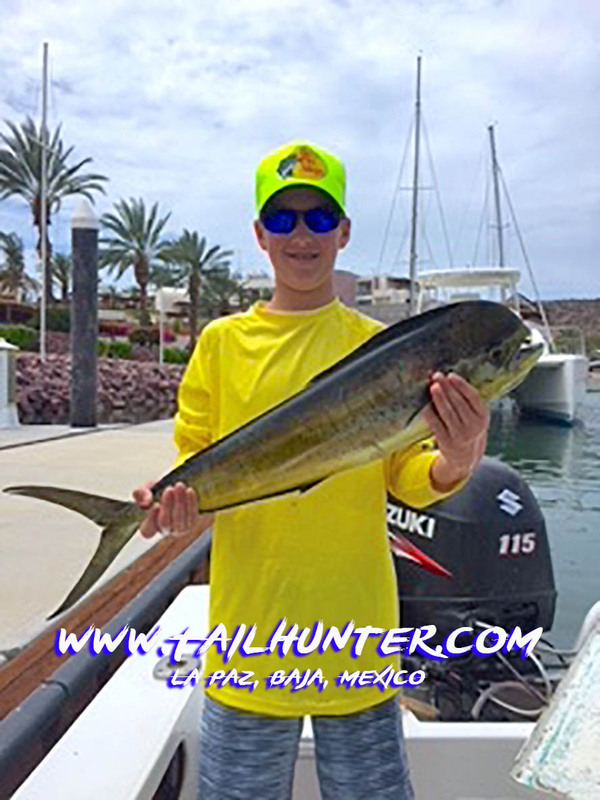 Starts off his trip with a quality bull dorado. Jason is from the San Diego area. 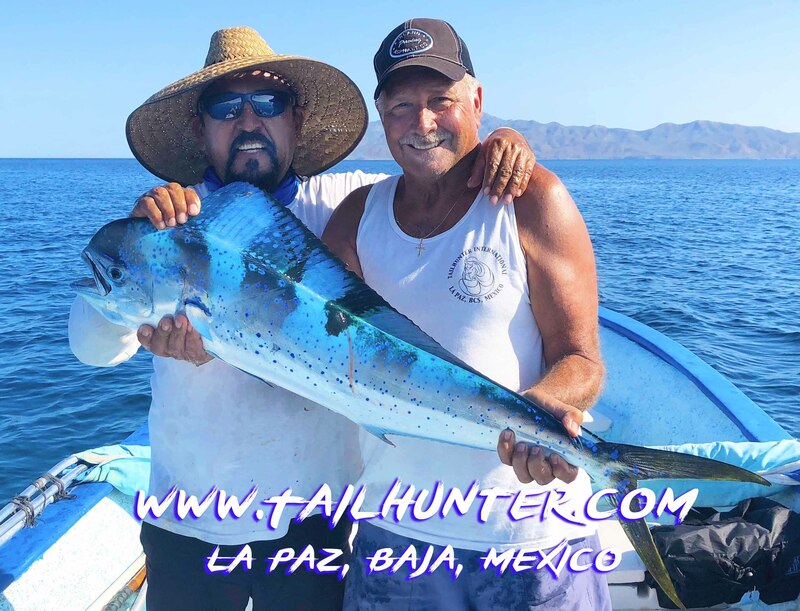 Bennett Clegg has a habit of visiting us at Tailhunter each year and sticking some nice big fish like this big bull he caught while fishing with Captain Victor. A little cloud mid-week down here, but the dorado bit for Jeff Klassen who got limits in the box and poses with two on the beach. 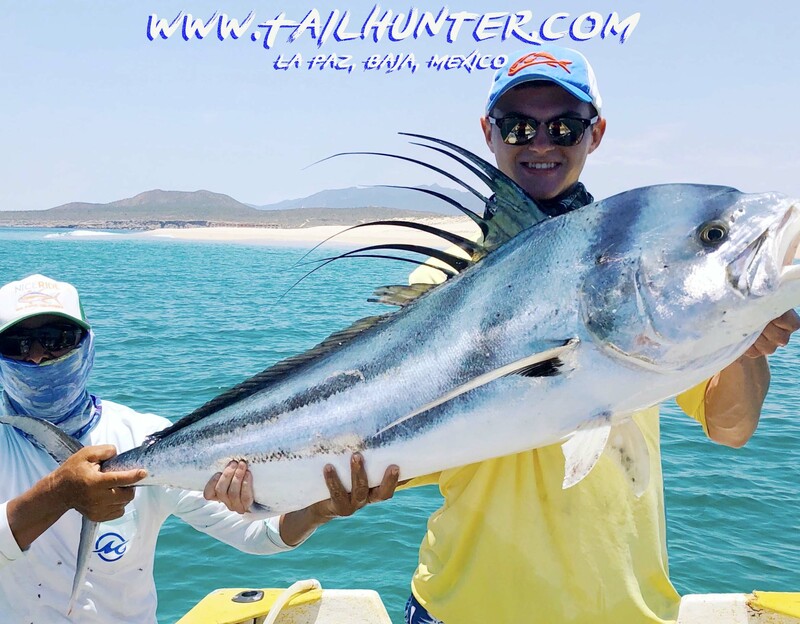 Like I said above, Bennett Clegg from Santa Rosa CA seems to always find big fish and was fishing light tackle 12-pound test in a school of medium dorado when this huge roosterfish blew up on his sardine and battled him on a very light rod for over an hour! The fish was photo’d and released strong. Bennet…not so much. He called it day after that and came in! 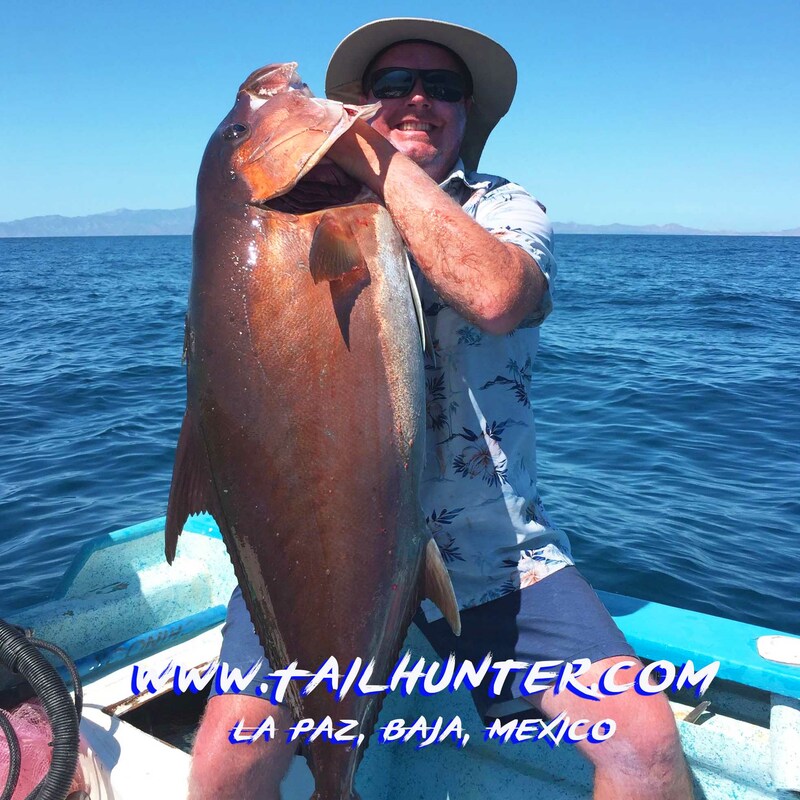 Fish estimated at 50-60 pounds by the Tailhunter Captain. Christina Morales from Lakewood CA has never been fishing and is about as tiny and petite as a button. 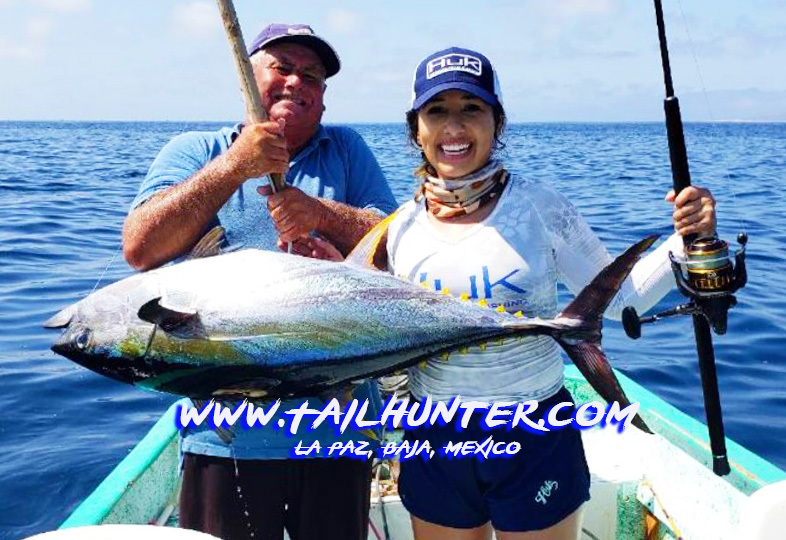 She and her family came to fish with Tailhunter in La Paz and her very first fish ever is this pig tuna she wrestled over an hour in the sun in a spinning rod with Captain Arcangel. But, she got it in with no help although Captain Arcangel did a great job maneuvering the panga and was as proud as Christina to get the big fish. I’ve seen this guy with so many nice fish over the years that he has caught with us. Sam Sybesma hold up one of his limits of dorado. He said while he battled this big bull, his buddy, Jeff caught 4 others! If his tongue is hanging out, it’s for good reason. 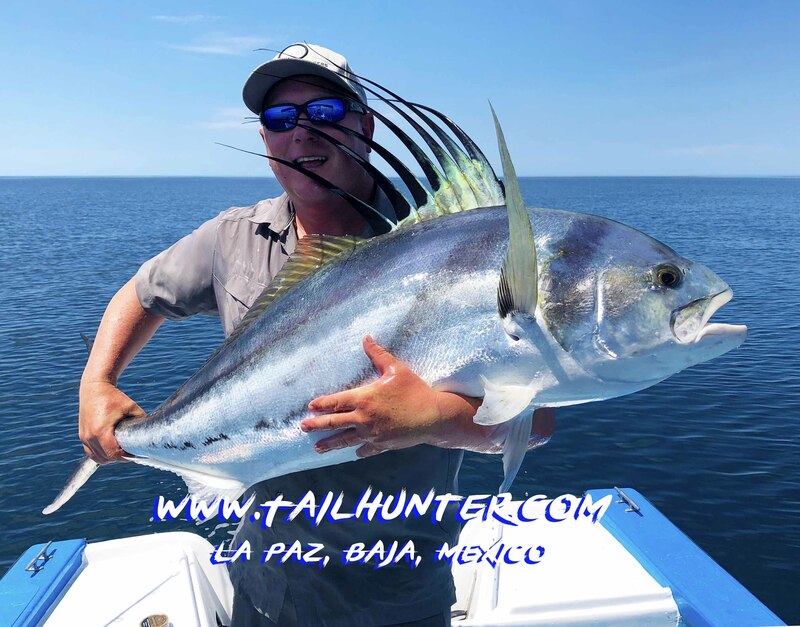 Mike Shaw from Oceanside CA battled this beast of a freckled roosterfish over an hour when it slammed his live bait north of La Paz fishing with the Tailhunter Fleet. 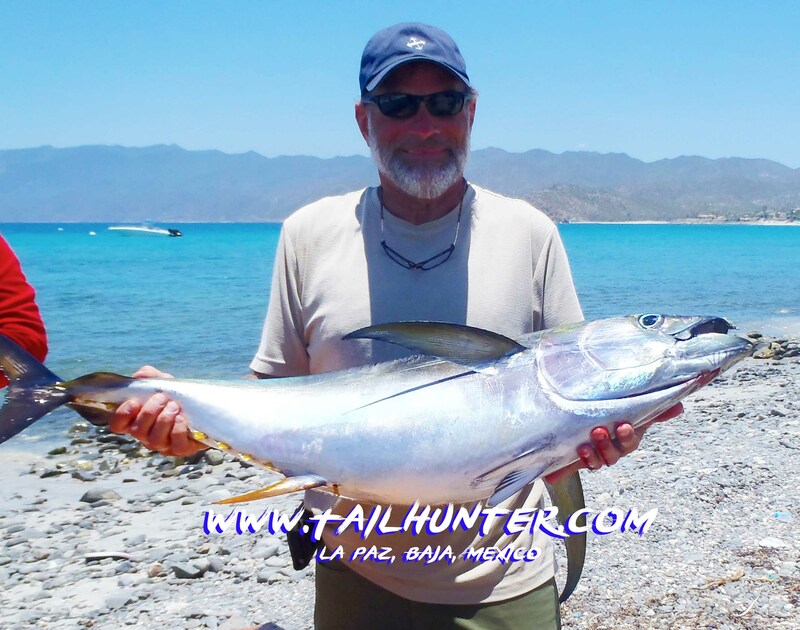 The fish was caught not too far off Punta Coyote and was released. Estimated at over 70 pounds! Darrell Manginelli is from Ventura CA and fishes with us every year. 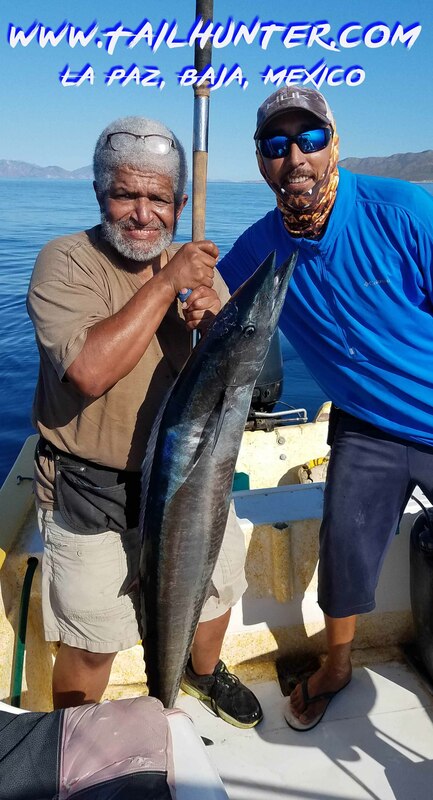 Captain Pancho poses with him and one of Darrell’s wahoo. Nothing like having kids hook up! 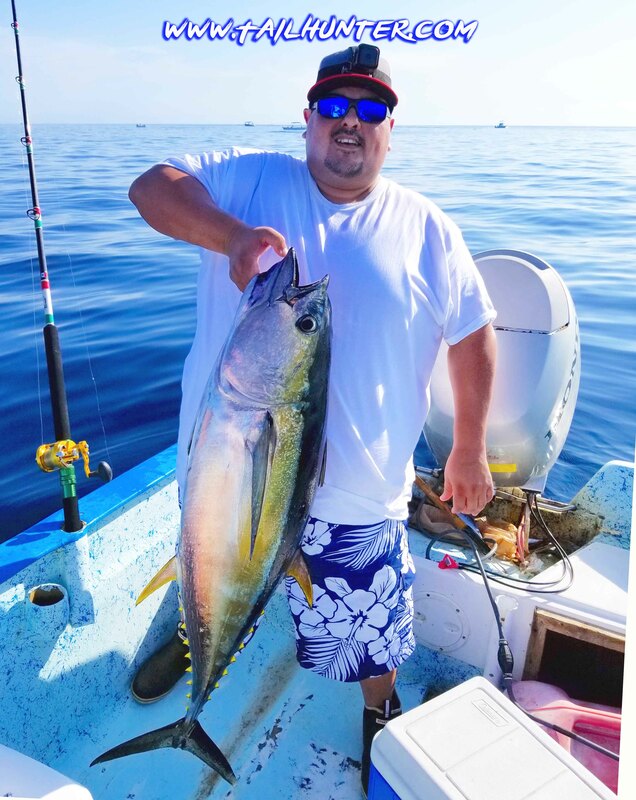 Eleven-year-old Fernando Balderrabano was with his dad, Manuel, when they got a nice pair of bulls plus a bunch of other dorado in the box while fishing north of the city with Captain Rogelio. 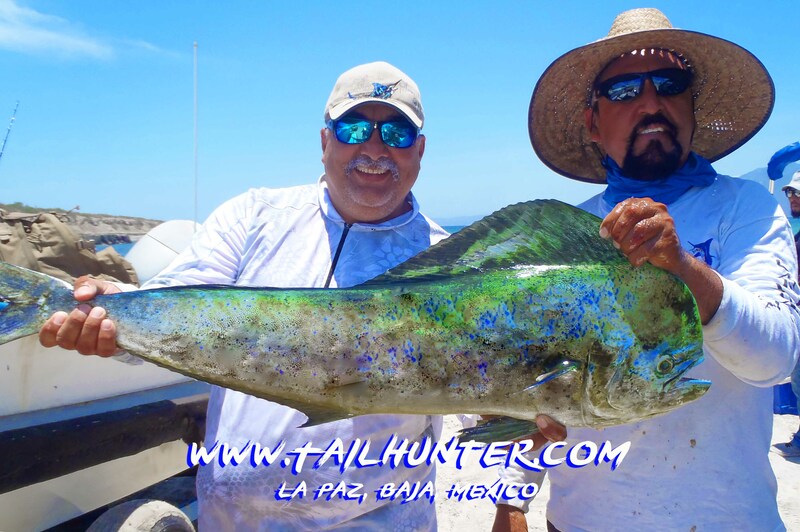 Great colors on this dorado that Alicia Clegg caught among several others fishing with our Tailhunter La Paz fleet. Check those flat waters! Light tackle monster for Dan Shay of San Diego who was fishing with a spinning rod when he knocked this fat amberjack. Captain Armando with Greg Ponte and a great eating barred pargo taken off the rocks. 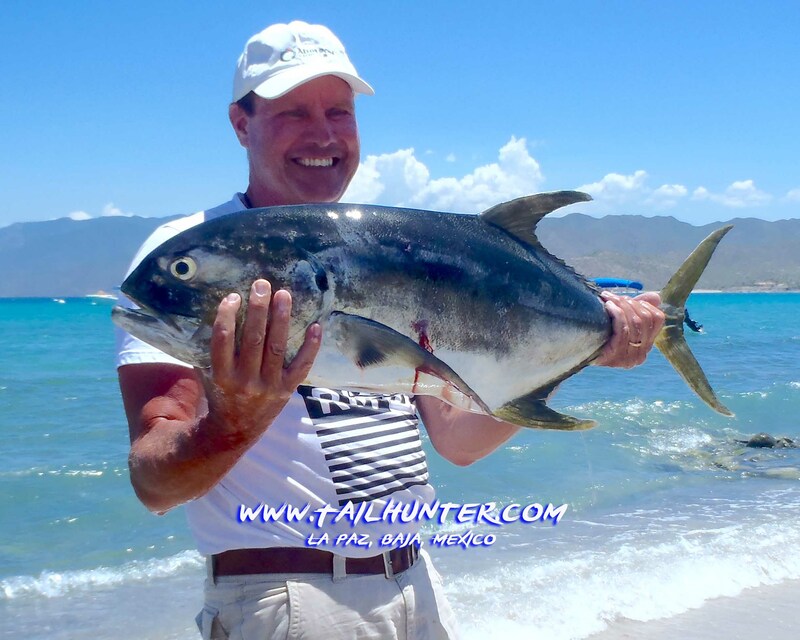 Mike Shaw on the beach at Muertos Bay with the tail of a nice yellowfin tuna. The fish is bigger than it looks. Mike’s a tall guy! 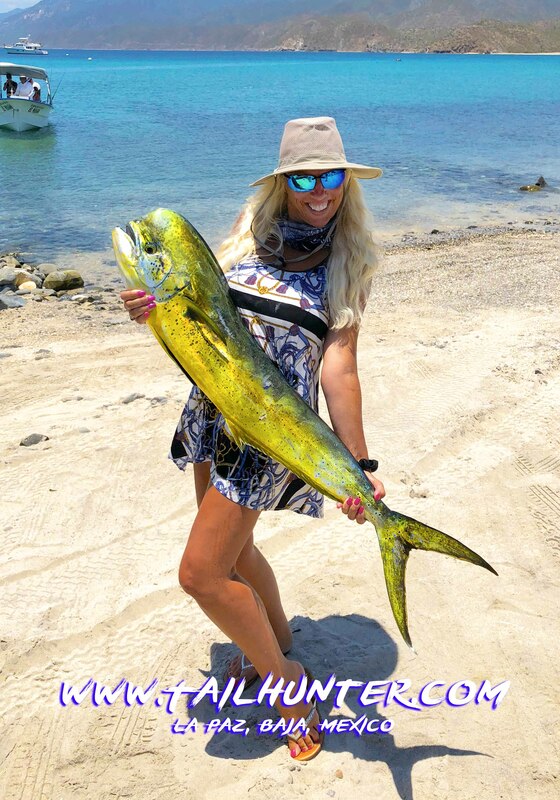 Great photo and a nice dorado for smiling Alicia Bennett. Glenn Rowland with the 2nd of two wahoo he caught while fishing with Captain Pancho. All the way from Sweden! Mike Sjosvard had a few roosterfish hooked, but got away. He still got a nice jack crevalle…close cousin! The Morales Family…Ruby…Christina and Jesus from Lakewood CA with enough to fill a few ice chests including dad’s wahoo and two big tuna. 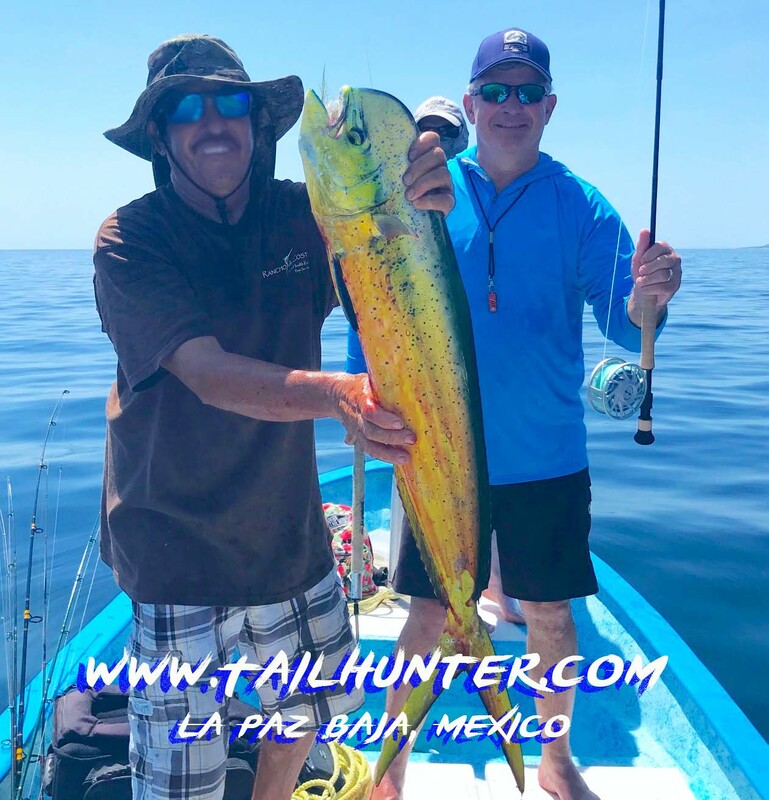 Incredible colors here on this bull dorado with Darrell Manginelli. 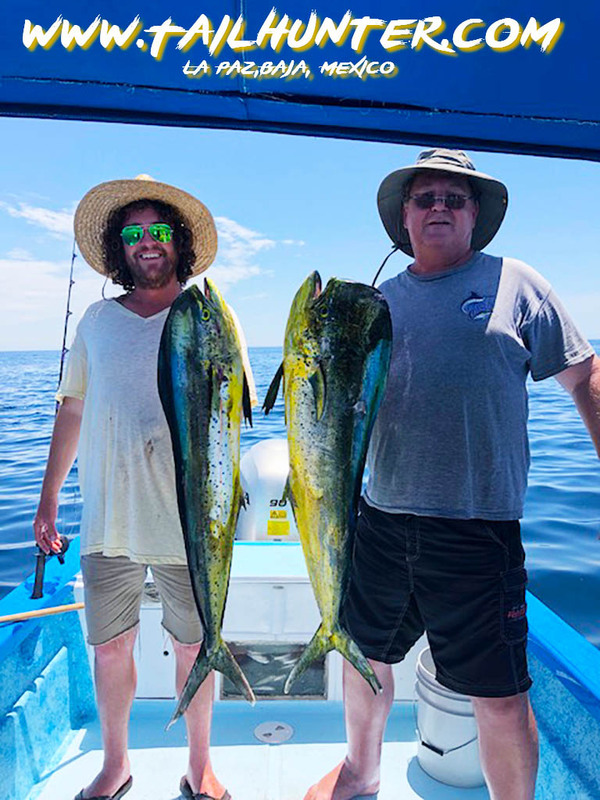 First-timers Scott Van Essen and Joel Warners have their hands full with a couple of schoolie dorado. It was croaking according to Bennett Clegg who caught this near Espirito Santo Island. Jack crevalle are tough fighters and yes…they do make a croaking noise! One of the happiest guys to visit us. Glenn Rowland from Ventura CA had himself a nice week of big fish. Hope you had a great 4th of July holiday week! It wasn’t a great week of fishing, but it wasn’t too bad either! 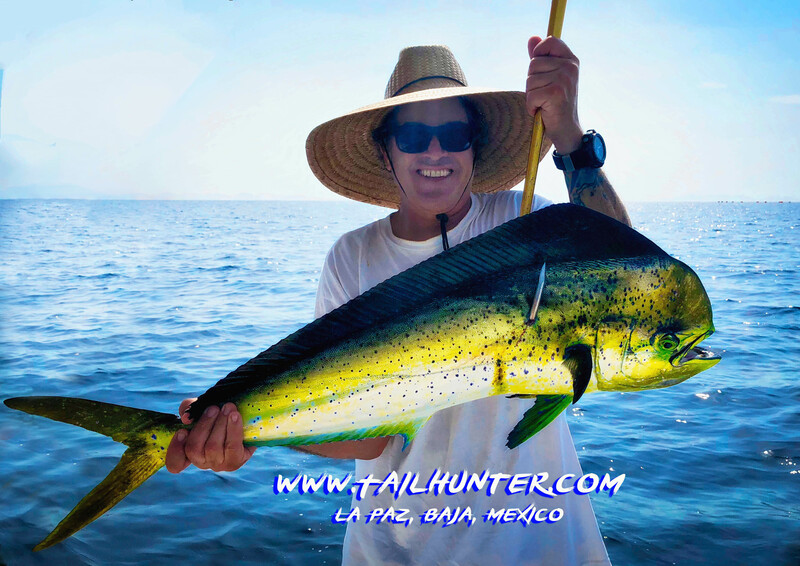 For sure… The fish are there and the highlight was the appearance of a nice grade of dorado. The thing about the fishing this week was that it could still be spotty here-and-there. One boat could get fish and another right next to it would struggle. One boat can’t get bit and the two next to it are bent all day. No rhyme or reason. It’s just fishing! Most of our folks who fish with us fish for 2, 3, 4 or more days . There could be an off-day or two. But, the good days usually more than made up for the down days with big fish or plentiful action . The biggest problem might be with folks who were walk-in clients or only scheduled one day of fishing. They could be the boat that just happens to have a slow day or the boat that loses their biters as often walk-in clients don’t have a lot of experience. But, overall, some nice fishing this week for the most part. 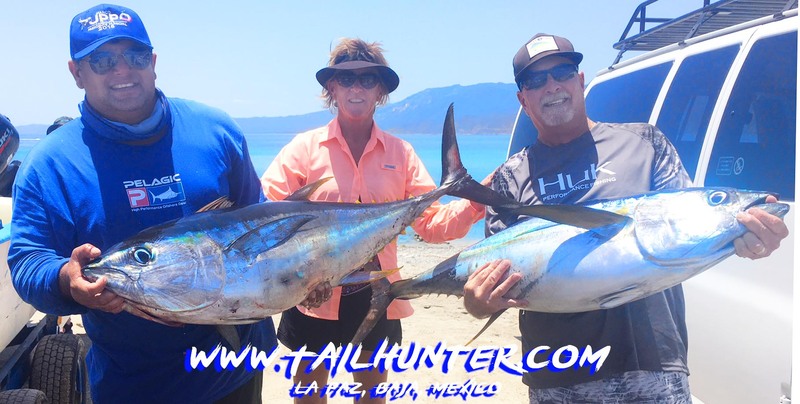 Our Las Arenas/ Muertos Bay Tailhunter Fleet found the tuna a little closer to home base this week. The tuna were found off the south side of the big island negating the run all the way up to the north end of the island. The fish are quality 40-60 pounders. The issue is that they did not always want to bite. Some days, the went on the chew. Other days, especially when bait was tougher to find, the fish had lockjaw or guys saw then boiling or they were fast movers and just didn’t want to eat. Wahoo made up for the slack on some of those days with some quality 30-40 skinnies that ate the Rapalas or Mega Baits or bit the live bait. Also, some big roosterfish and better quality dorado between 15 and 40 pounds helped ease things. Still, for the most part, fishing Las Arenas/ Muertos area got you big fish or not much. 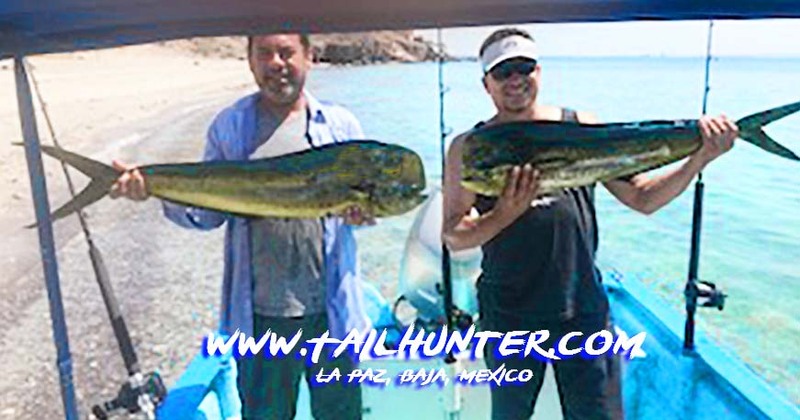 The better action was still with our Tailhunter La Paz Fleet. Encouraging to see more schools of dorado gathering up. Especially if you can find the patches of sargasso weeds floating on the surface or the right current line. Nicer fish in the 20-30 pound class showed up too. Some days, you’d pick-pick-pick getting a dorado here and there or, if you found the honey hole, then it could be dorado rodeo with every rod bent non-stop. 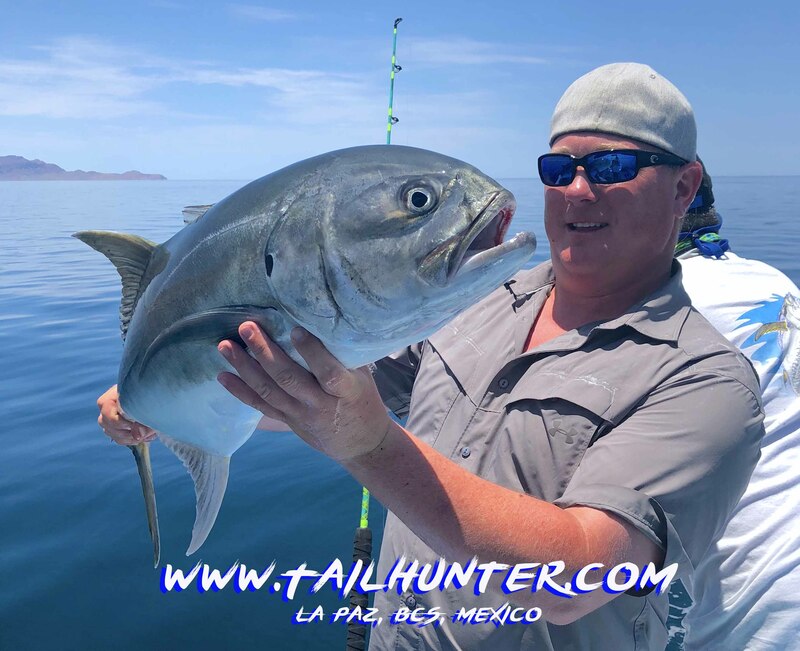 Some holdover amberjack and yellowtail are still around in the rocks as well as pargo, cabrilla, snapper and jack crevalle. Some unusually big roosterfish too! 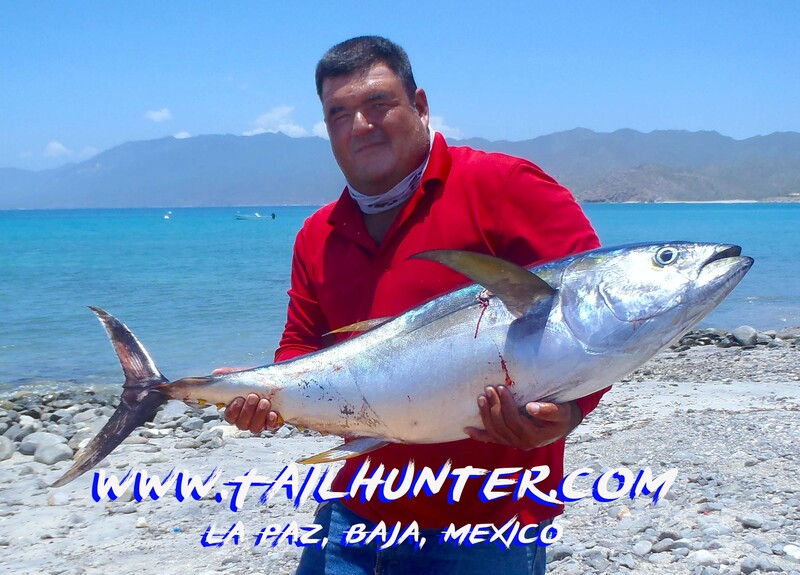 Fishing – Still lots of big fish around like tuna, wahoo, dorado and billfish. 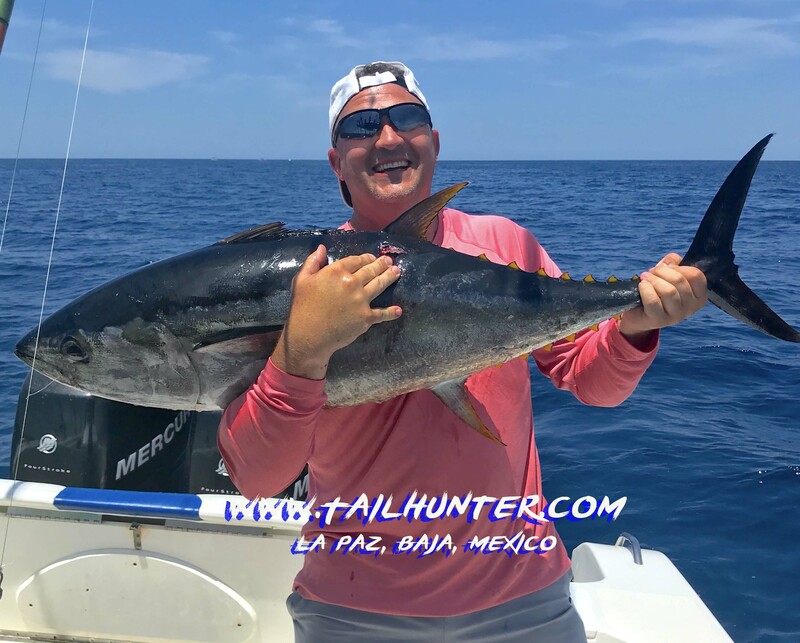 Good on smaller species too like pargo, cabrilla, jack crevalle, bonito and still some yellowtail and amberjack around too. But the bite has been erratic. 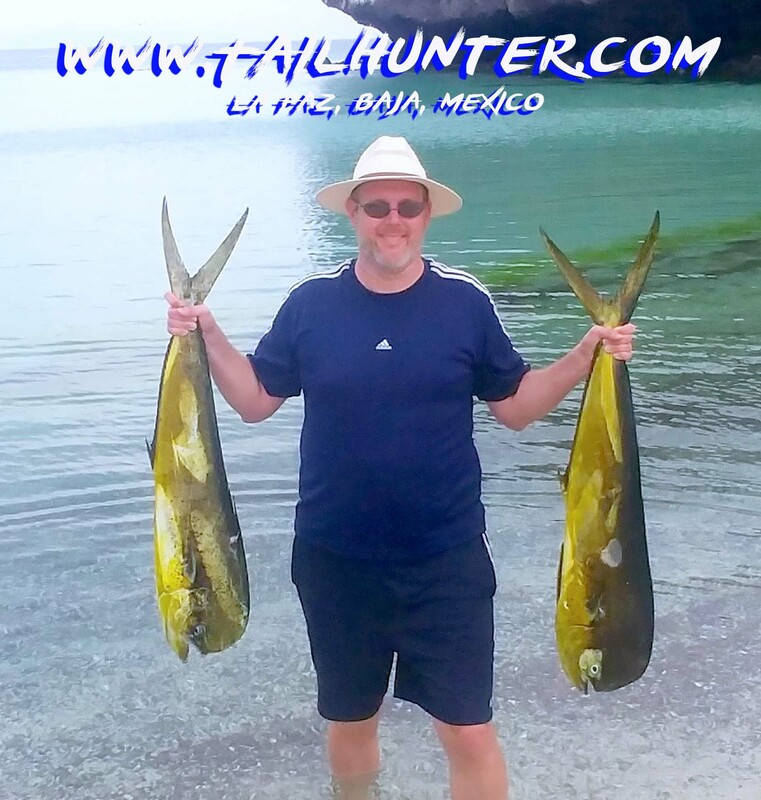 Sometimes fish like dorado and tuna all around, but won’t eat! 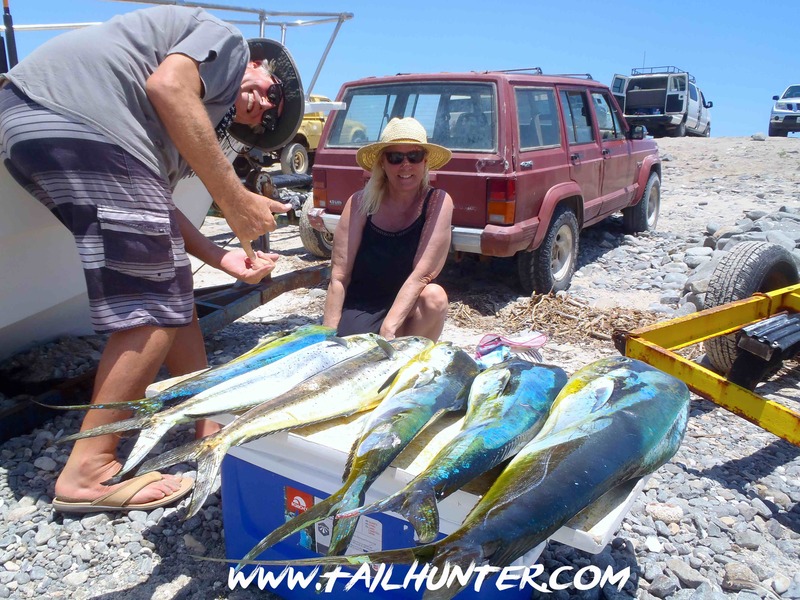 Catching – Sure lost alot of big fish this week or fish in the rocks. The big fish are tough. The smaller fish make it tough by being in the rocks and having attitude. Water – Still some cloudy cool waters around, but getting bluer. Finding the blue water is key. Bait – Las Arenas it’s hit or miss. Mackerel and really small sardines. 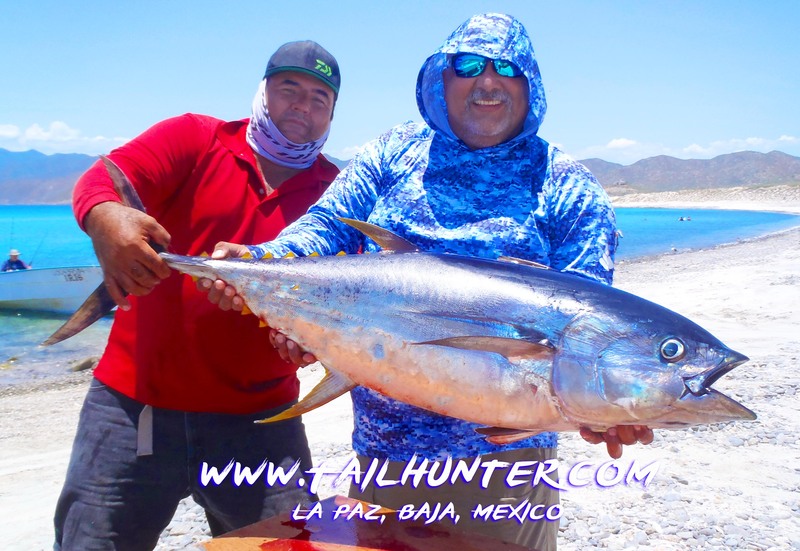 No problem for bait with out La Paz fleet. Rob Baird from Oregon showing the nice grade of yellowfin tuna we got this week around Cerralvo Island. 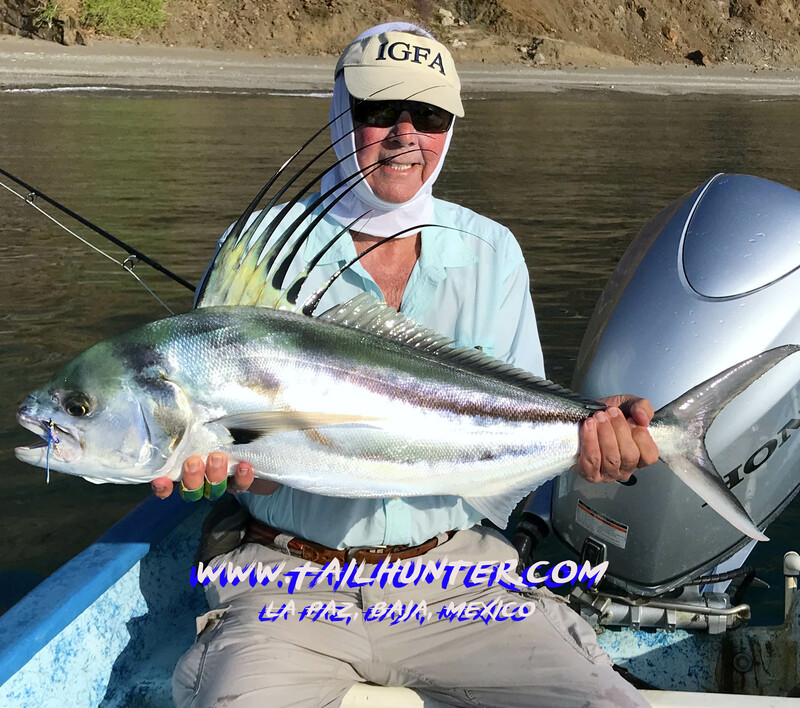 From Carmel CA, Bill Mitchell fishes with the Tailhunter Fleet at least once a year and on a quick get-away with his flyrod fished La Paz and got this nice roosterfish just off the rocks as well as several others plus jack crevalle and bonito. He released all his fish. 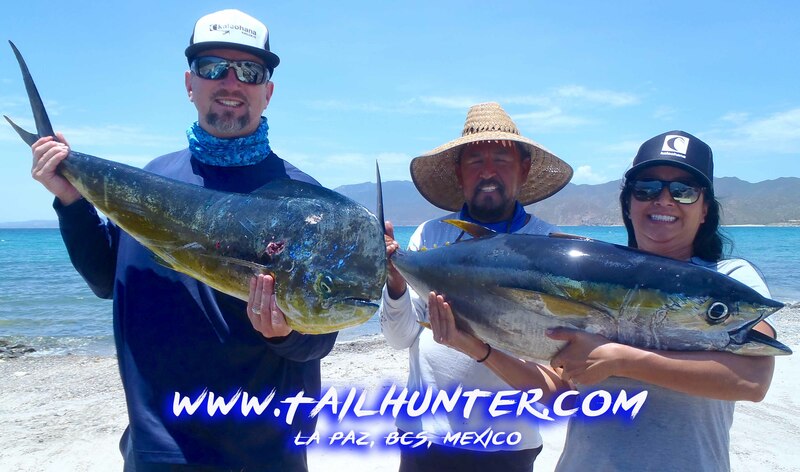 Kurt and Brenda Gallow from Washington have come down several times to fish with the Tailhunter Fleet in La Paz. While fishing with Captain Armando, they always do well. Five minuts after dropping back some Rapalas near Cerralvo Island, Brenda got this fat wahoo followed by Kurt with the 2nd wahoo. Another nice fish for our amigo, Gary Wagner and Miles Wagner from Colorado Springs. Gary owns the Rancho Costa Resort and also the Giggling Marlin Restaurant in Cabo. 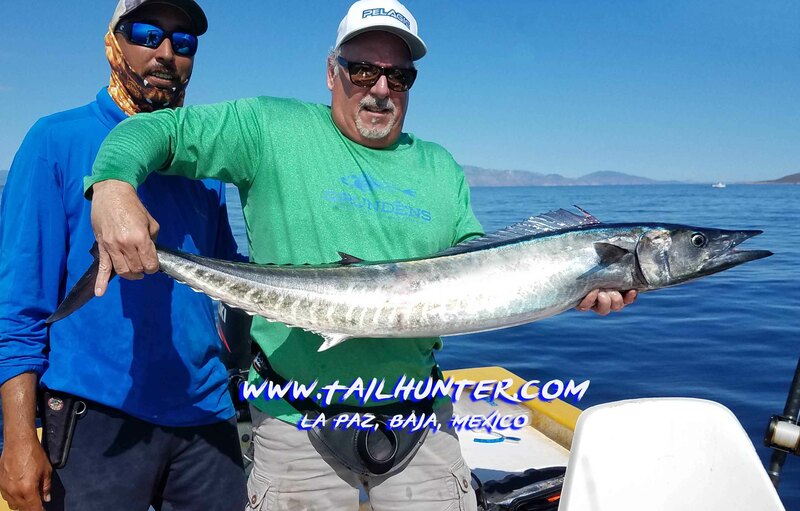 Captain Armando with Jason Veberette and Greg Ponte from Herald CA showing off a first-day catch of wahoo and a dorado. 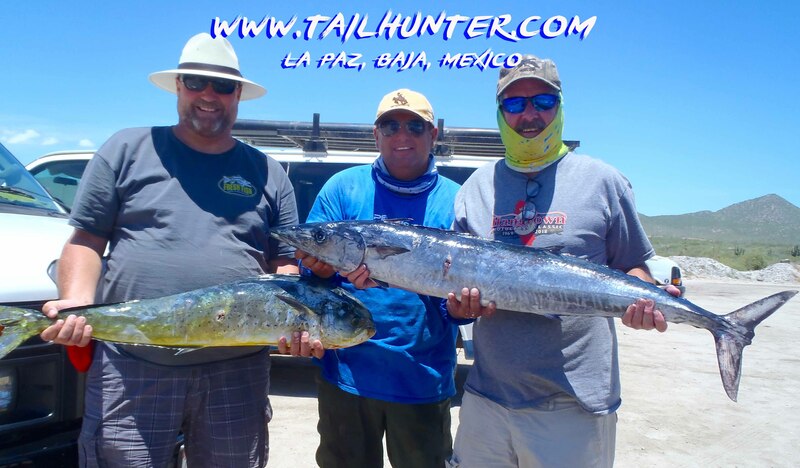 Captain Jorge, with Rocky Schneider and John Teply and a trio of nice yellowfin. First-timer, Andy Kelly from Florida had never been fishing but battled this big tuna in the sun for over an hour! When it came time for the photo, his arms and hands were still shaking so he asked Captain Gerado to do the honors! Good job, Andy! 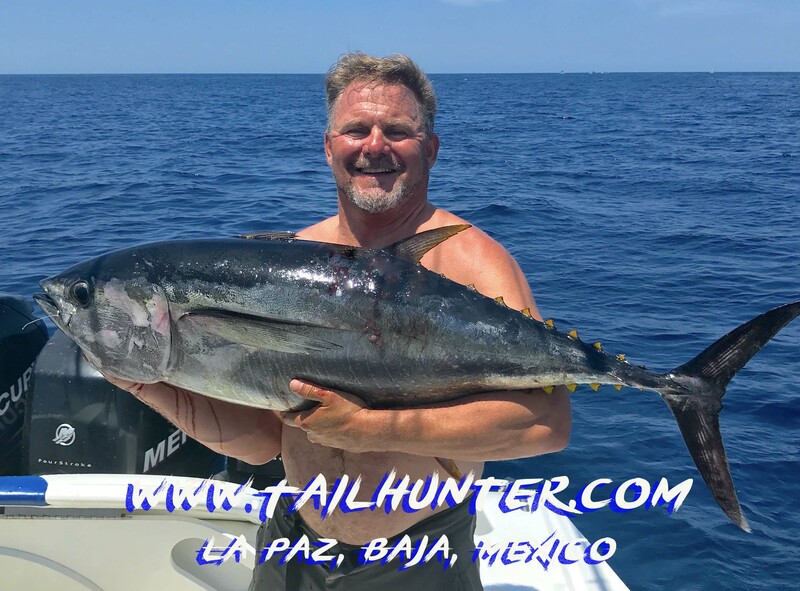 Our amigo from Loreto, Steve McGavern, put this big tuna on the boat at the 11th hour, but it’s a good one! 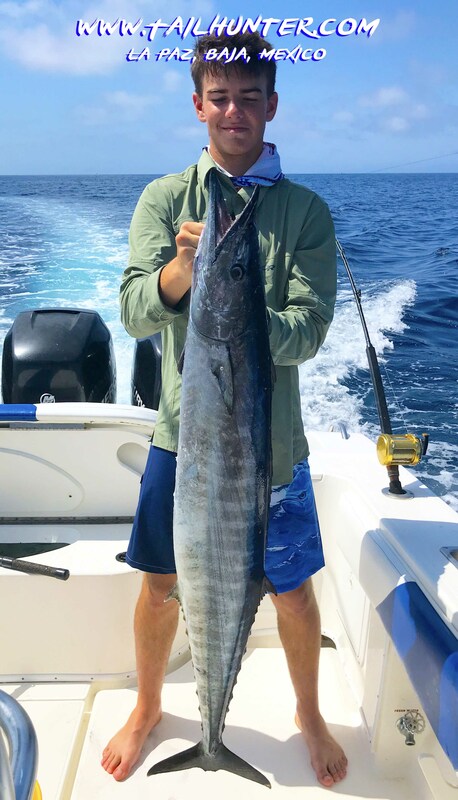 Miles Wagner from Colorado Springs CO had himself a pretty good week showing off another wahoo in the boat . Favorite photo of the week! We call this “Dorado Envy.” From yesterday, Kevin Ritchie caught looking at Jason Beverette’s dorado is classic! Rocky Schneider had the “touch” this week on tuna! Check out the flat water and the big fish that Andy Bautista of Corona CA caught! 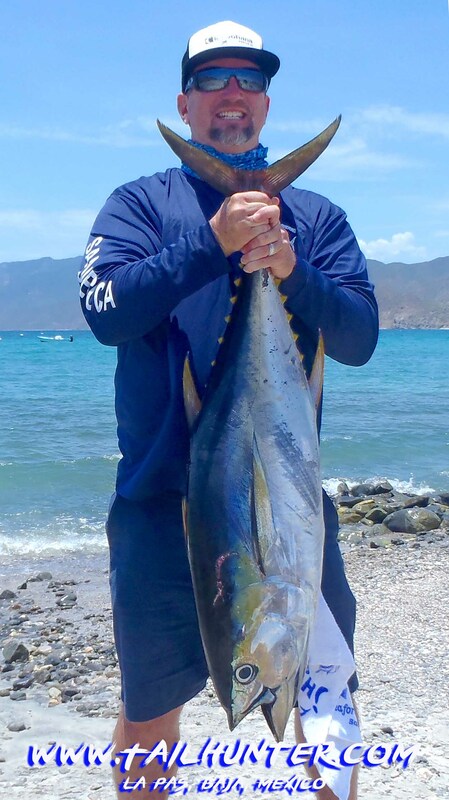 Another Oregon amigo, Mike Keser got the biggest amberjack of the week. It was another of those weeks of either highlights or lowlights and not much in between. There were big fish and there were assorted smaller fish (for fun) and then…well, not much in that middle area. You either got fish…or you didn’t! The big fish were big. No doubt! If you got one, it could make your day. Or your trip! 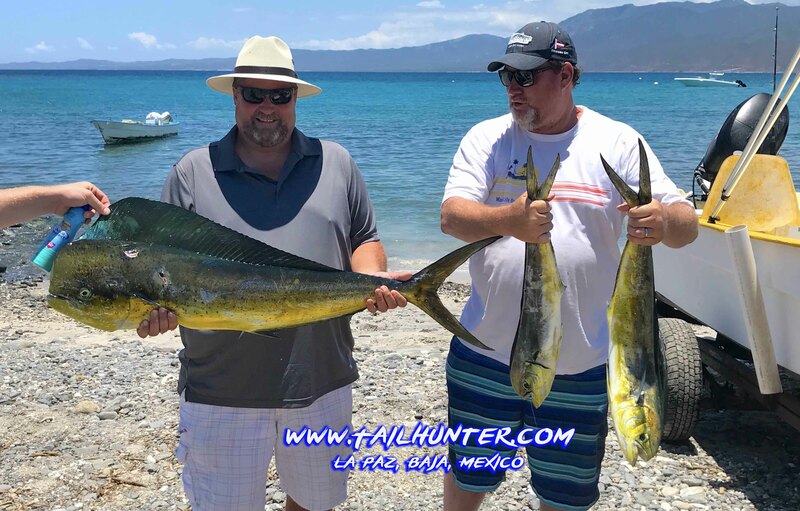 At Las Arenas/ Muertos Bay Tailhunter Fleet, the action around Cerralvo Island and Punta Perrico again focused on the bigger grade of tuna that popped up about 3 weeks ago. And these fish were not pushovers! The tuna were big and grumpy. The smaller fish were 40-pounders. The larger fish (we caught) were 60 pounders. Anyone who’s fought Baja yellowfin of that size knows these aren’t little “football” tuna. And we lost probably 60-70% of the fish that were hooked either through inexperience, busted lines or hooks…or simply bad luck because well…that’s fishing! Good fishermen lost big fish. Rookies caught big fish. No rhyme or reason. But either way, heart-breaking when you’re on a fish for up to an hour or two and it busts off. And you never see it the fish…just hours with a bend rod…straining line…sore back and arms…wondering what you have on and praying just to get a glimpse. Or it’s “at color” right next to the boat and “BINK!” The line snaps. Or the fish just unbuttons. Or someone gets over-anxious in the hot Baja sun and loses their patiences and tries to horse a big fish to the boat. And the fish is just too hot and green and strong to come in. And breaks off. Some days, if you just looked at the numbers, it looked like a terrible fishing day. Very fish coming in. But after you talk the anglers, almost all of them had a shot at a fish or two…or three! And dumped the fish! Good fishing…bad catching. And, there were also days when the fish were crashing and breaking and just not eating. On top of the tuna there, we also had a nice jag of wahoo as well . Some nice speedy ‘hoo meat. 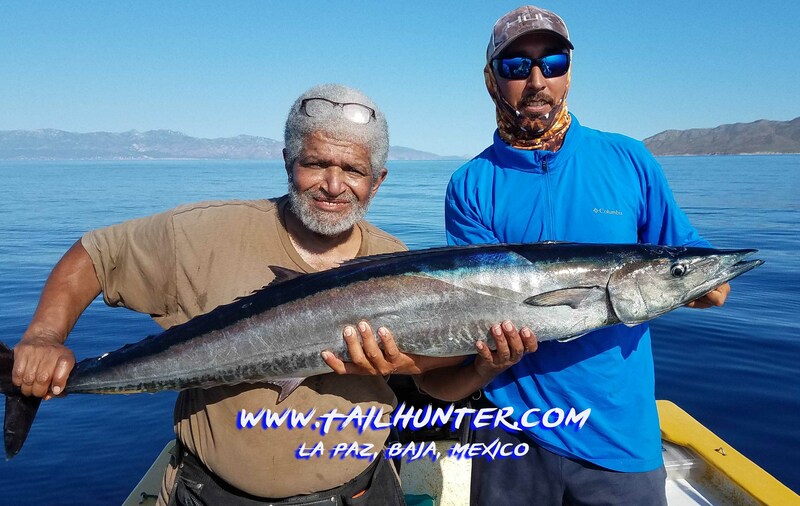 The wahoo were chewing on Rapalas and we did get some fish up to 50 pounders. But, again, fish were lost. But, that’s part of fishing! 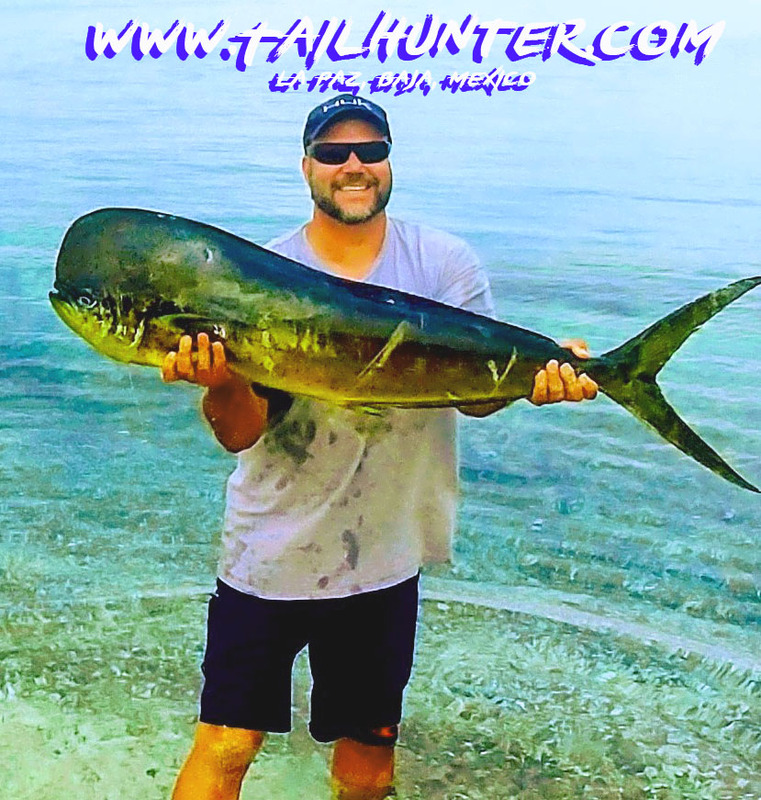 Add in a lot of pesky feisty bonito, jack crevalle and a few others including a few marlin and there was still some action to be had even if no fish were put in the coolers. 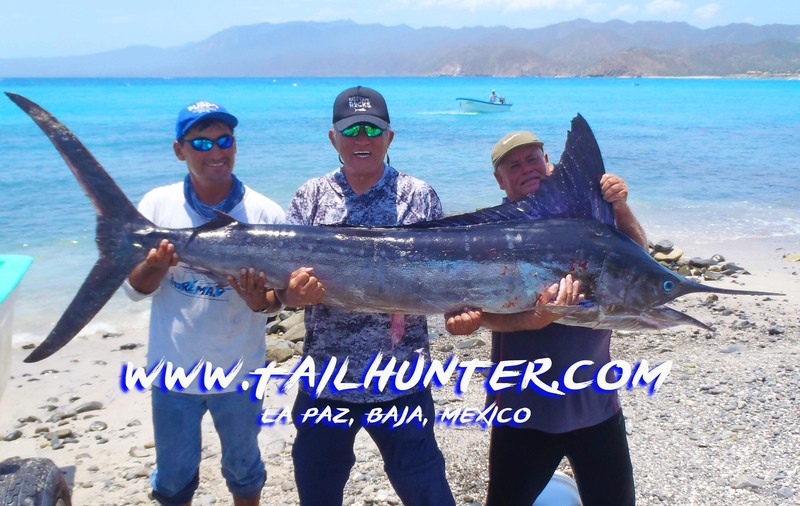 For our Tailhunter La Paz Fleet…again, this was the fun area to fish. Not much in the way of big fish, but there wer some school-sized dorado. In the rocks there’s lots of snapper, big pargo and cabrilla and even some hold-over cooler water yellowtail and amberjack. Lots of fish lost in the rocks, but you could easily have 10-30 biters a day even if you lost most of those fish, you still got a nice chest of fish at the end of the day. I think I counted about a dozen different species out’ve La Paz.